As the holiday shuffle concluded and the new year was upon us, we started to wind down and get back into our normal routine. We enjoyed playing with our new toys from Christmas, park dates, and breakfast donuts! A new Krispy Kreme moved in down the street and we justified biking to the store as the equivalent to burning off at least one donut. Our friends came down with their two sweet boys and we had a fantastic time catching up, going to the Dallas Aquarium, and just lounging around enjoying good drinks and even better conversation. 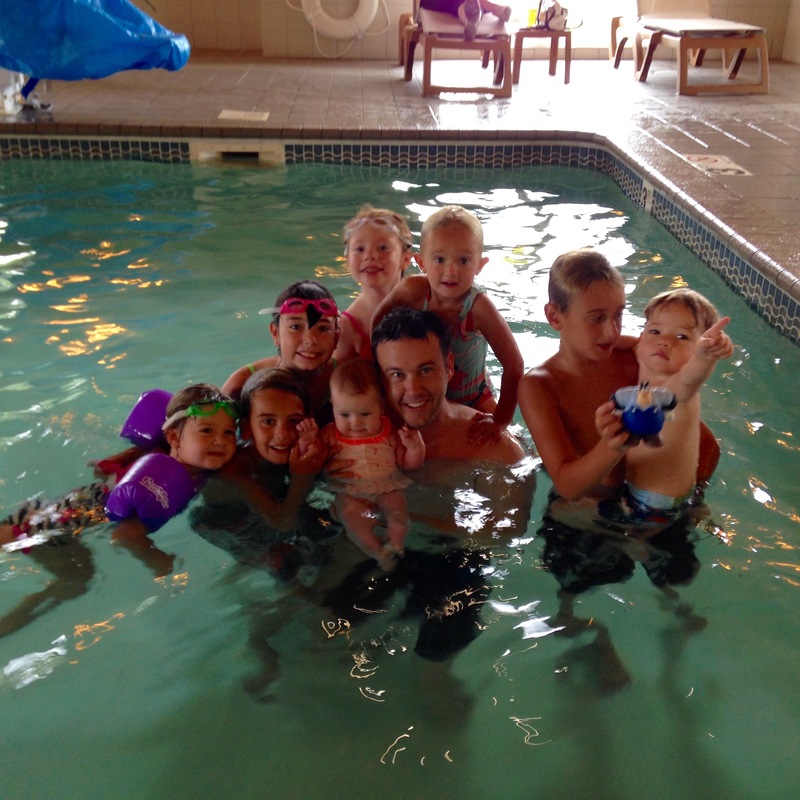 Jack and Meredith started swimming lessons and absolutely loved it. 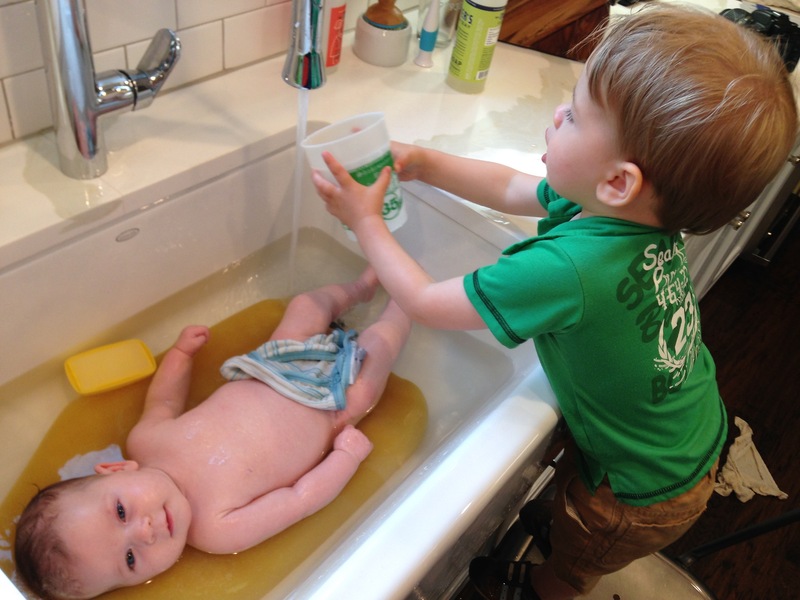 Jack had been swimming prior to Meredith’s birth but this was the first time for Meredith. It was wonderful to see them both enjoy the water and their teacher Ms. Sara. In February, Jack consistently started jumping out of his crib. The hubs and I sighed then transitioned his crib into a bed, knowing that things would never be the same with a toddler not caged at night. 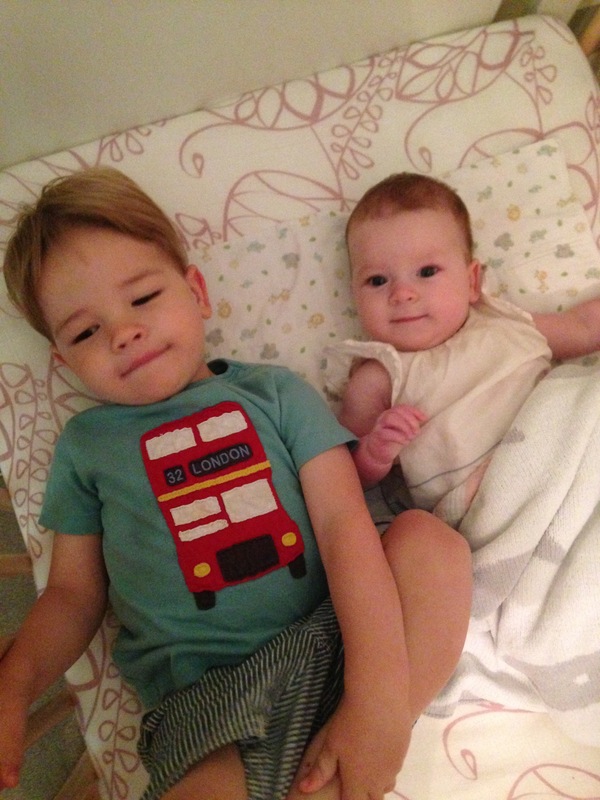 But first, Jack and Mer spent the better part of the day and that evening breaking in this new toddler bed. The transition went better than expected. There were a couple of nights Jack was up and a couple more we found him in Meredith’s crib, but all and all the transition to the toddler bed was great. At the end of February, Meredith started standing on her own and taking a few steps. Of course, she had to try her own approach to standing; we just wished it was on the floor. I applaud her independence but fear for her teenage years! Easter was in March this year, so we were able to celebrate with multiple Easter egg hunts and Meredith’s first birthday all in the same weekend. Jack loved all things Easter and embraced the Easter bunny a lot better than Santa. 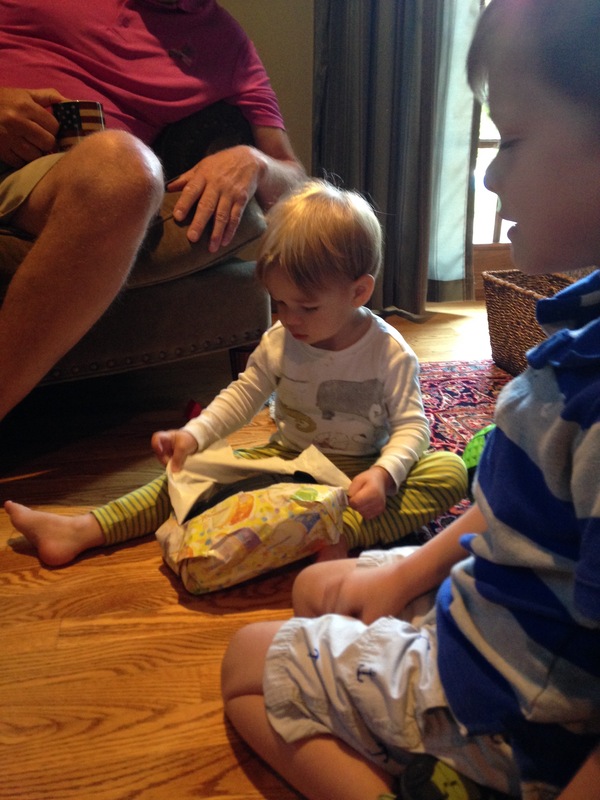 We celebrated Meredith’s 1st birthday with lots of cake and even more presents. They both loved tearing into the raspberry filled birthday cake. I had a few tears at my baby turning one. The days definitely can be long but the months always go by way too fast. This sweet baby girl has been such a welcomed addition to our family. Meredith is such a spitfire, knows-what-she-wants kind of lady. Her giggle is so infectious and she started saying Mama with a purpose! 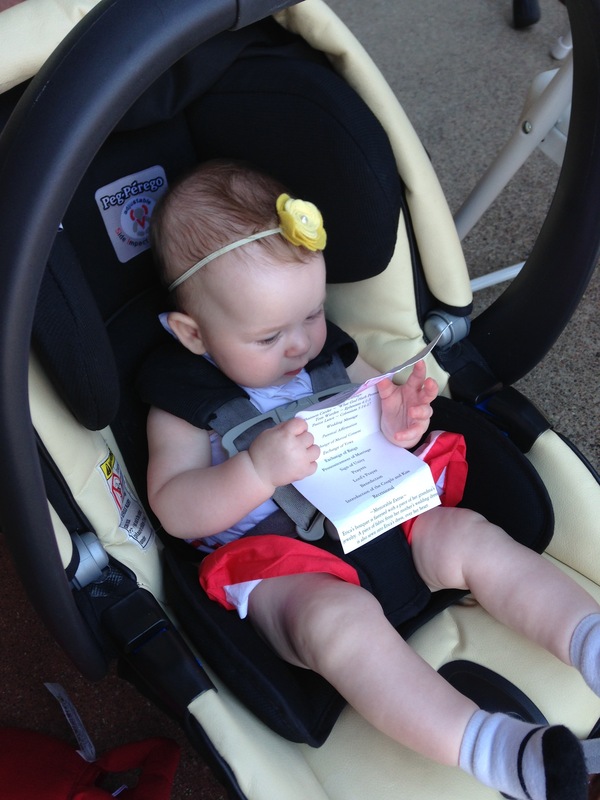 Of course when she was nine months, Dada was her first word. And “Otis” and “uh oh” came in May. We love seeing her grow. We were lucky enough to have my Dad and Deb come down for all the festivities. They had an Easter egg hunt for Jack set up in our backyard while Mer enjoyed taking off on Jack’s four-wheeler and tractor. Meredith waited until everyone was settled in at home and things were back to our usual routine to finish her birthday month with a bang! Her first real steps/walk! She did great!! I laugh now thinking I was worried I wouldn’t have enough room in my heart for two babies. I was worried Jack wouldn’t know how much I love him after Meredith was born. But it’s quite the opposite; not only do you love them, but you love who they are. You realize how different each one of your children really is and embrace their personalities with huge, open arms. April was filled with Burley bike rides to the park and to get ice cream, of course! We had many lazy weekends with lot of eggs, fruit, and bacon! And even more french press coffee! After all that fuel, we stepped outside for more play. Life is good. We made BBQ Pizza on our Green Egg and I recommend it to all! It was super fast and so tasty! The smoky flavors of the Egg mixed with BBQ was such a wonderful treat, making a great southern style pizza. Please try! At the end of May, we were pulled back to St. Louis once again to wish some dear friends a wonderful life together. We enjoyed a night out for their rehearsal dinner. With good food and great friendship again, we asked ourselves why we ever left! The day between the rehearsal and wedding was spent enjoying friends and their tire swing in their backyard! Jack thought it was the coolest horse ever! The wedding weather could not have been any better and we were able to make it to two places we loved in St. Louis for part of the wedding festivities. Busch Stadium, yes, I’m still secretly supporting the Brewers, but gosh, it’s a beautiful stadium, fun team, and great fans! We also stopped by the candy shop owned by the bride’s family. How cute is that vintage sign! The store is even cuter and their chocolates are absolutely amazing! We have gotten spoiled during Easter when they send down chocolate covered eggs! My favorite are the milk or dark chocolate caramel eggs with a dash of sea salt – I add the dash of sea salt. My mouth is watering as I type. Trust me, if you live in St. Louis, try them! Or buy them here! They are delicious! With the hubs family so close, they volunteered their babysitting services and the hubs and I spent the first night ever without our babies. It was amazing to wake up without anyone to tend to! Maybe it was easier knowing they were well loved with their cousins and aunt watching over them. A special thanks to Jill for taking care of them that night! We spent the last day of our St. Louis trip with Papa and Grammie. Discovering the big red train downtown was the excitement of this trip! We headed back to Dallas as always, with heavy hearts, missing all things that were great about the trip: family, friends and the familiar. 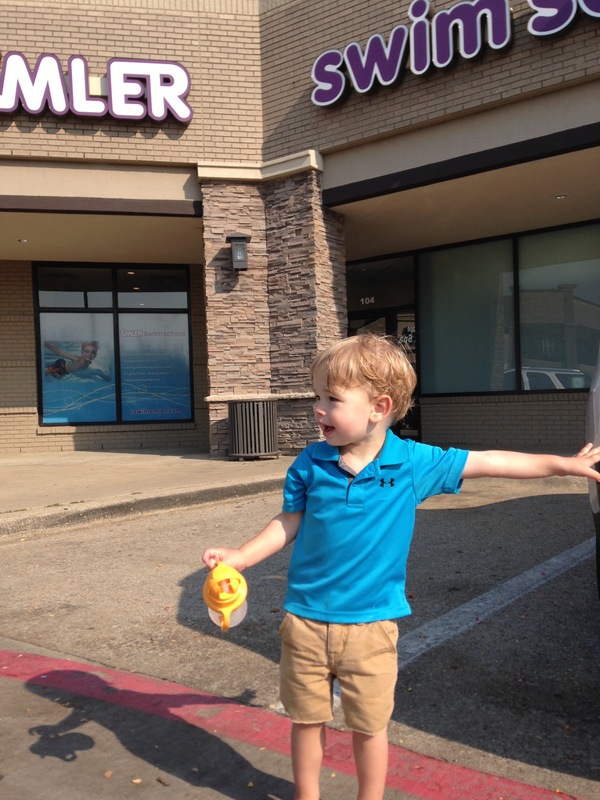 Back in Dallas, we ended the month with Jack’s big potty training adventure! We spent may days in the bathroom wondering what was going to happen. Meredith was always there for support and I printed off a sticker chart and bought prizes to help motivate Jack for all those trips! He finally got it down and we were elated to get one kiddo out of diapers! I’ll be back with the last two catch-up posts soon!! Meredith turned two-years-old this month, and it’s only fitting as her new year begins, for me to play massive catch up. 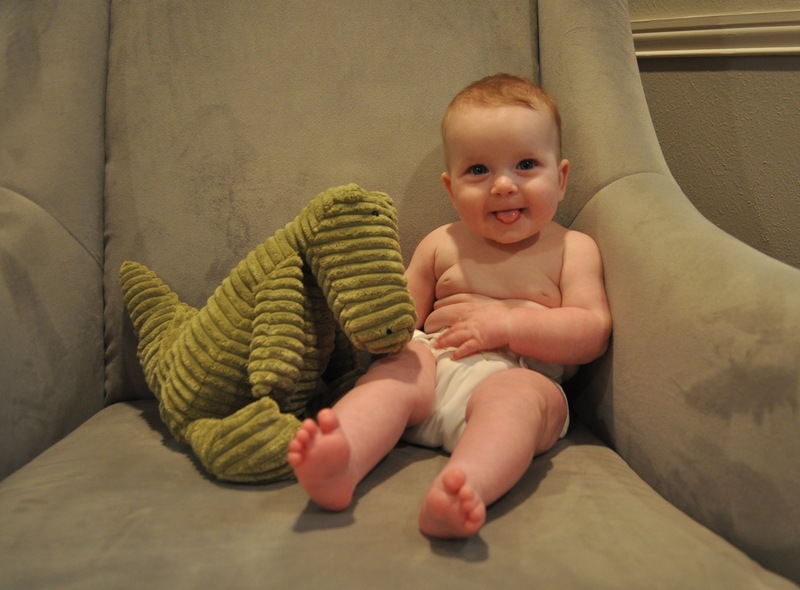 The last update was when Meredith was 6 months, so there has been a lot of growth happening around our household, including a sweet little boy. He keeps getting bigger and sweeter; you’ll see that, too. 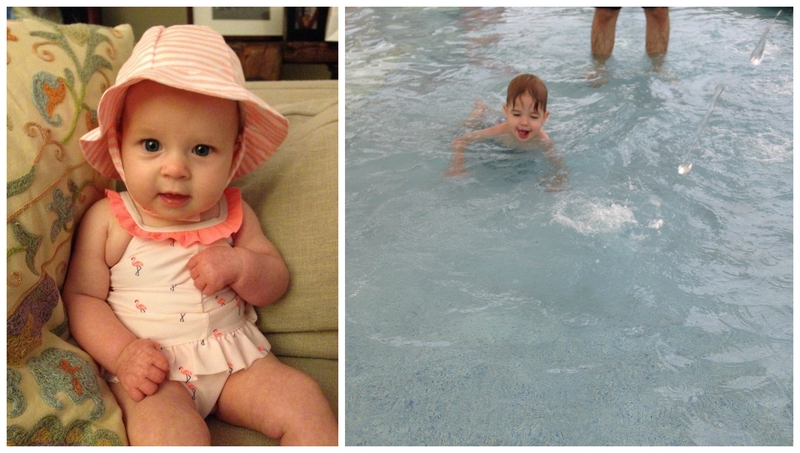 This means it’s been almost a year+ since I’ve updated you on their sweet transitions from baby to toddler. My heart aches a little because I feel like all my photos and all my memories aren’t solidified until they are published on this little blog. So, instead of starting now with the new renovations, recipes, and moments, and there are exciting ones (eek! ), I’ll do a mini catch up, in four parts, to make my heart happy and hopefully yours, too. We spent the fall 2015 enjoying Dallas again. As the summer temperatures slowly faded, we embraced the fall weather with open arms. Jack enjoyed entertaining Dad with his Mizzou gear. We really do love football season around here. MIZ and Go Packers are definitely words our babies know well. Plano had their annual balloon festival, where we arrived just in time for the lighting of the balloons and to worry Jack a little with the sounds of all the balloons being blown up. We visited pumpkin patches at the Dallas Arboretum to get our yearly fix of pumpkins! In Dallas, pumpkin patches are more like a glorified outdoor petting zoo for kids with pumpkins dispersed about. Jack and Meredith absolutely loved it! We celebrated Meredith’s baptism weekend with family. We’re always so grateful for our families making the trip down to Texas and only wish we could have them down more often. Or be closer to home. I guess I’ll just have to keep having babies so they keep making the trip! Ha. Meredith had a wonderful time taking up the spotlight on her big day. What a beautiful day for our sweet baby girl. She did great in church, but enjoyed her Papa even more. We picked my brother and sister-in-law as Meredith’s godparents and were so thankful they were able to make the trip down for the occasion. 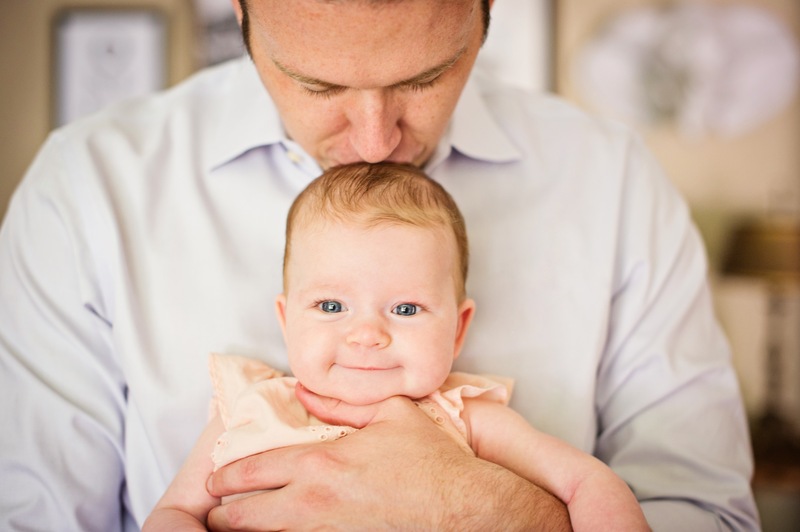 Meredith’s smiling ice-blue eyes are identical to my father’s and brother’s, so it’s only fitting we have Eric as her godfather. And then it was back to our normal routine as a family of four. 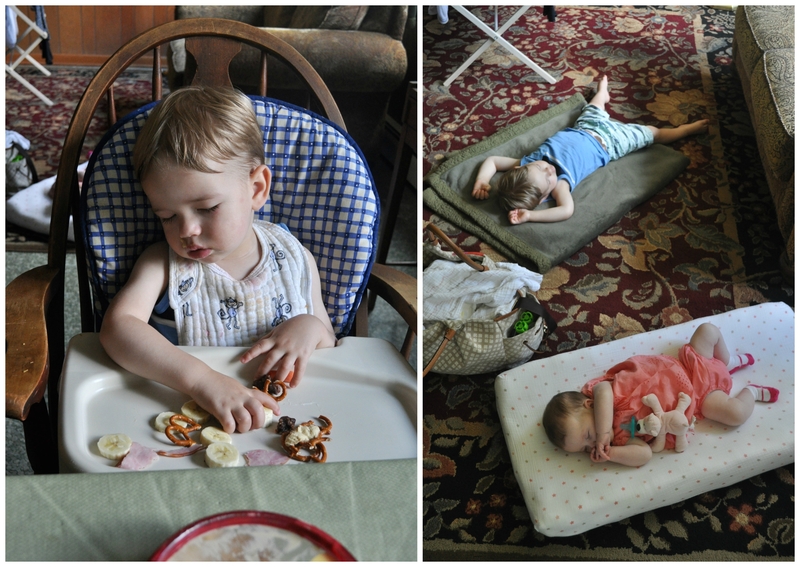 There were a lot of lazy mornings spent lounging, playing, and making brunch. This usually involved good breakfast food and long adventurous walks. Jack always has to stop for sticks or rocks on our walks. This kid can find them anywhere and Dad loves him bringing them back to our home and yard. Jack had his first injury that fall. He was laying on Boston and as Boston got up, Jack hit his ear on the coffee table. I finally reaped the benefits of my day job on this one, though, the doctor I worked with was kind enough to come in and help stitch up Jack’s ear. “You don’t want to sew up your own son, Sarah. I’ll be in to help.” Jack was a trooper, and I think we missed dinner that night and went straight to ice cream to celebrate his first stitches, not having to go to the emergency room, and Jack taking it like all like a boss! Go Jack! I think sour gummy worms can heal all wounds. When Halloween rolled around, we were prepared for the occasion with 1st Halloween jammies for Meredith. Mer was’t too sure about her first Halloween, but Jack was there to reassure her with hugs; this was going to be a great day! We celebrated with our neighbors, Jack’s first actual trick-or-treating, lots of candy, and some beer for us adults. For Meredith’s first Halloween, she enjoyed being her older brother’s sidekick as a football. The cutest football I’ve ever seen, actually! And Jack was a football player. Again, the cutest football player we’ve seen!! Side Note: Mom broke her sewing machine sewing in those cute shoulder pads for Jack! But it was totally worth it!! We ended our night passing out candy to the big kids that could stay up after dark. We also enjoyed the fruits of their labor, splitting a kit-lat with Jack. Meredith had her first plane ride in November. I flew alone with her up to Wisconsin. We were lucky enough to sit in first class and have this wonderful grandfather of two sitting next to us. He even held her by the bathroom door after I changed her, so I could go to the bathroom. PSA: I know it’s hard, but be kind to parents with children on the plane; they want their children to be quiet and calm as much as you do. I’ve been pretty lucky with our two travelers and more empathetic than ever before to others. While Mer was up in Wisconsin, because I was still nursing full-time, Jack spent Thanksgiving with Grammie and Papa at their farm. I don’t think he was too upset about that. Meanwhile, the hubs and I spent Thanksgiving at Lambeau Field with my brother and sister-in-law. Back in August, he surprised me with this awesome gift to see the Thanksgiving game at Lambeau, and to have my brother and sister-in-law there too, was a wonderful (and too quick) trip for all! Green Bay welcomed us back with rain (we were wishing for snow) and cold temperatures. You can definitely figure out who lives in Fargo and who lives in Dallas from the picture below. We had amazing seats provided by my Dad and waved to Bart Starr and Brett Favre that night. Brett got inducted into the football hall of fame and I became a Brett Favre fan again, a little, that day. Why the Vikings Brett, Why?!? Gosh, I hate purple and those stupid Vikings! We drove down to Missouri after our magical night with Meredith and picked up our sweet baby boy in Missouri. 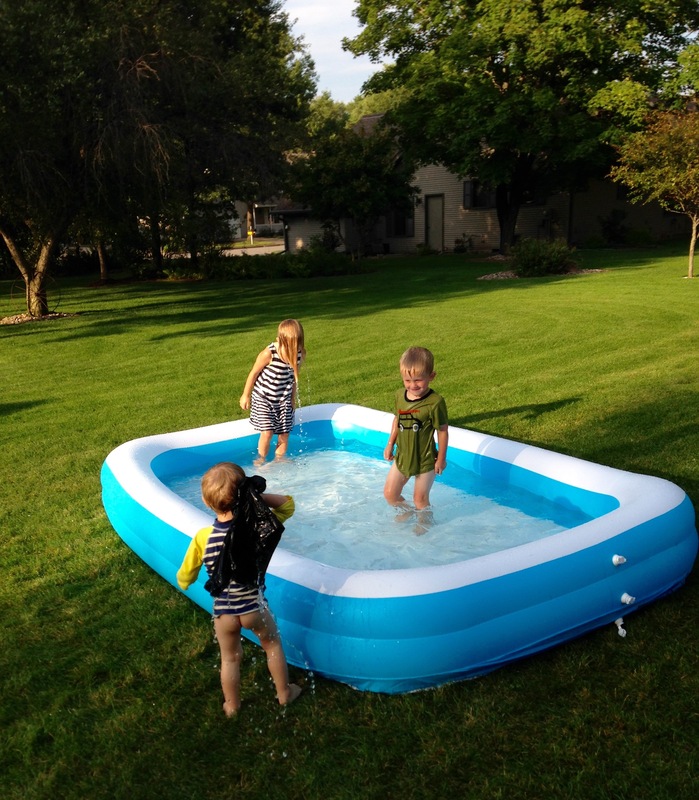 Their cousins were there to keep them entertained and not wanting to leave. We headed home with heavy hearts always longing for more time and to be closer to our family. We stopped at our usual Steak n’ Shake to fuel up for the rest of the ride home. Jack enjoyed a cheeseburger, fries, and split an Oreo shake with Dad. All were happy campers to get out of the car for a while! In December, we continued to enjoy the Texas mild weather with park dates and long walks. My favorite season was upon us now! We scurry around decorating for the Christmas season and try to absorb all the magic of the season. I always wish Thanksgiving and Christmas weren’t so close and Christmas could last three whole months. The tree falling on the hubs started off the season with a literal bang! Luckily, no one got hurt and the tree looked beautiful as always when it finally was in the stand. Jack spent the majority of the season counting ornaments and being told not to touch them. It was a tough task all season. Mer on the other hand worked on her lego eating skills, started to crawl, and holding herself up. Oh, the magic of the season. Jack and I also had a heated debate about the importance of not throwing anything at the tree. To this day, we are still missing two magnets from Jack’s magnadoodle he got that year, and no one seems to know where they went? We went to the Dallas Arboretum for their display of Twelve Days of Christmas. My favorite was Seven Swans a Swimming, with two of my favorites gazing in awe. Our sweet community puts on a Santa’s Village throughout the Christmas season. Every night, Santa graces us with his presence, coming in a on fire truck and greeting all the children waiting in line. Jack talked up a storm in line waiting for the jolly guy, but when it was our turn it was nothing but tears. Oh, sweet Jack, maybe next year!! We spent our “Christmas Eve” making cookies and assembling “minimal assembly required” toys until midnight! I enjoyed a couple sips of coffee before reading the directions for the hubs. Our Christmas at home was wonderfully simple. We woke up with coffee in hand and enjoyed the kids wide-eyes at all the treasures under the tree. Then it was time for the Christmas shuffle as we hit the road to enjoy Christmas with our families afar. We spent Christmas in Missouri, but we decided to spend a few days at the farm before heading into the city to spend Christmas with the family. Jack absolutely loved it, and I was happy I packed his rain boots. After our time at the farm, we headed to see the whole crew for Christmas. We spent more time outdoors. Jack and Mer loved playing with their big cousins, and the weather was wonderful for December. Sweet Jack postponed his nap, so the big kids wouldn’t have to wait to open presents. He was in a daze the whole time, but endured the chaos of the moment and loved opening up his gifts. Plus, he had a lot of help if he got sleepy. 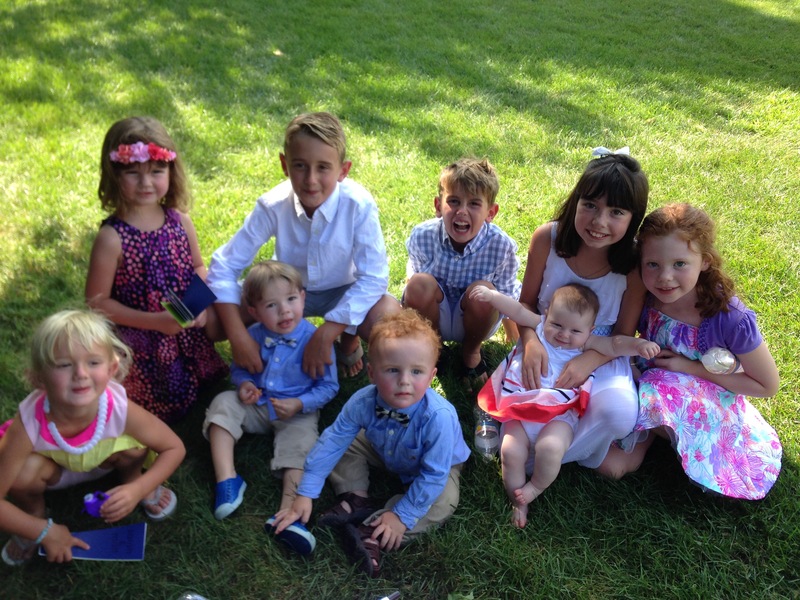 Mer kept busy with all the cousins and aunts that wanted to hold her. 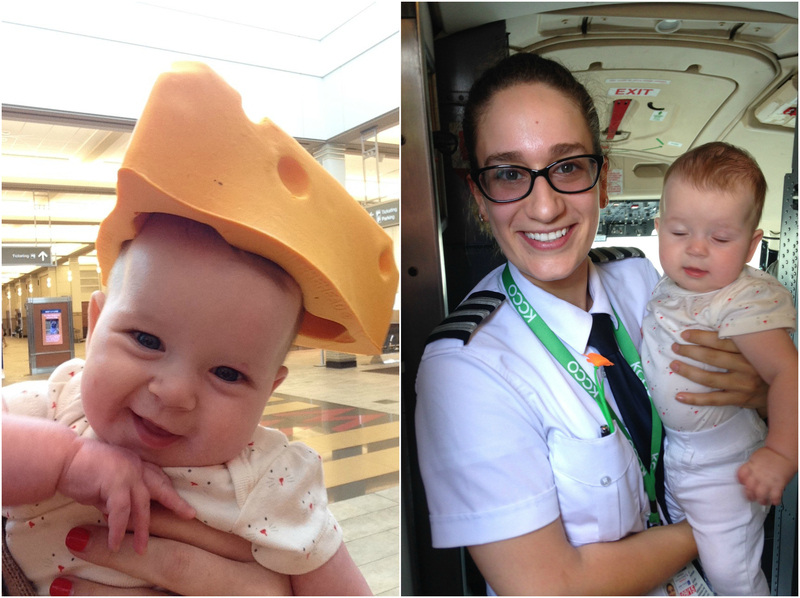 New Year’s was spent in Wisconsin and another airplane ride. Jack is becoming an old pro on flying by now. Plus, the stars aligned and there was an open seat next to us! So Mer was able to stretch her little legs, and I didn’t have to have her on my lap the whole time! Win-Win! My dad picked us up and we stopped off at Mullin’s Cheese to enjoy a Wisconsin delicacy: The Cheese Curd! 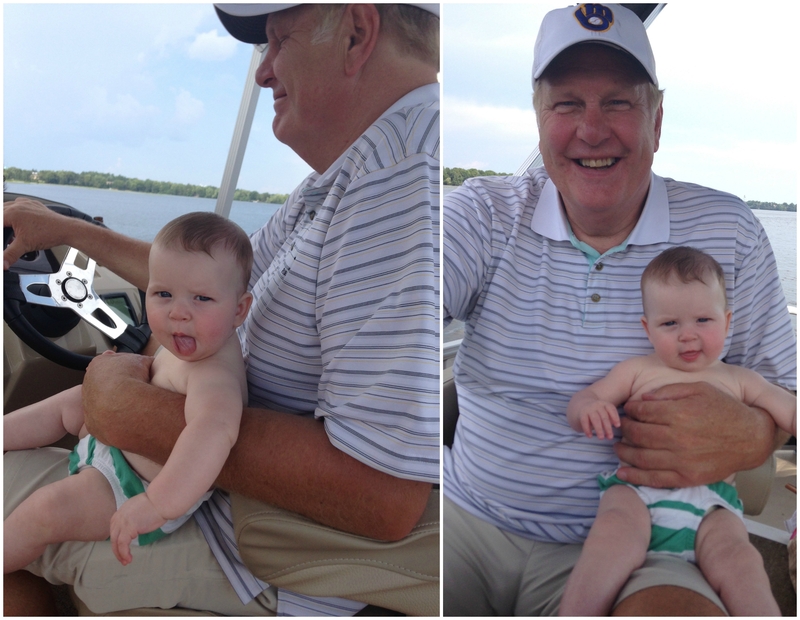 Wisconsin genes are strong in Jack. He loved them, squeakiness and all! Mer took a little cat nap and will enjoy some cheese curds in her milk later! There was a lot of lounging and sleeping during our Christmas/New Years in Wisconsin. Jack slept with Grandpa Wayne at night. He was in a crib in my Dad’s room, woke up saying he was cold, so my Dad brought him into his bed and was the perfect heater. I walked in to get him in the morning and saw them both sound asleep. My heart skipped a beat that morning. We opened presents New Year’s Eve and visited my sweet Mom in her assisted living facility. I did my usual prayer and cursing of God for the disease she has but thanked him for the amazing gifts I have in my life and my children. 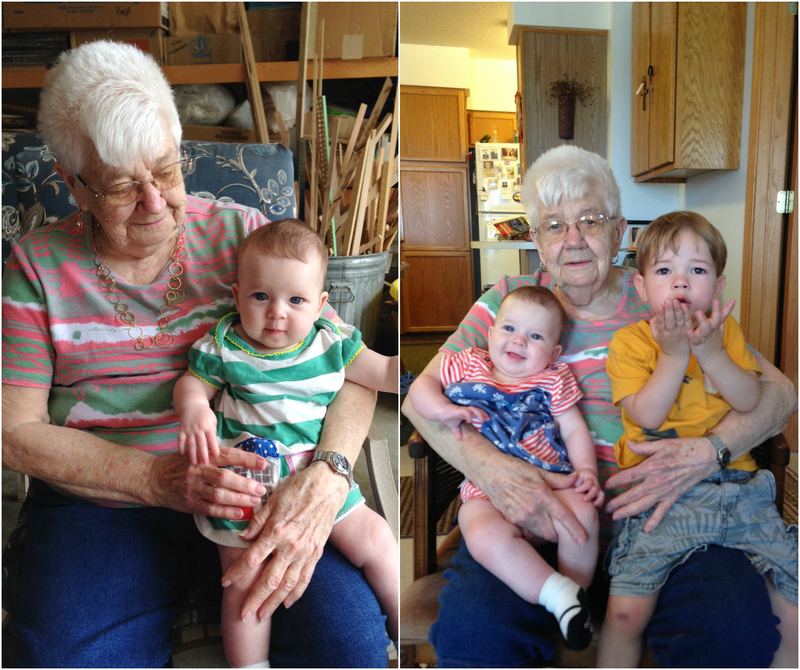 I always find comfort in my made up idea that she had a talk with God many years ago, giving up her own health to guarantee her grandchildren’s health, because these kids are pretty perfect. I know it’s silly, but it’s the only way I can make it through those sour moments at her assisted living seeing a shell of what she once was. She hasn’t known me for years now, but what hurts me the most is that she will never know her grandchildren. That night I stayed up to see the New York ball drop at 11pm and was fast asleep around 11:10pm. It’s hard getting old. We were off again to Texas. Another plane ride with my wonderful babies and another year upon us. This ends 2015! I’ll be back with the first third of 2016; including Meredith’s first birthday collage, Easter and many moments in between. Have I ever told you about this little house of mine? The hubs and I got it for a steal when the market was on cruise control, and we’ve been loving it ever since. The original owners only lived here a year and it was Jon and Jan that resided here until long into their retirement years. We walked into this home knowing it was loved. We actually got to meet the owner the day we walked through the open house. We must have been early, and Jan was picking up a few last minute items before she ran out the back door adding “buy our house – it’s a good one!”. During that open house, I could see the potential, it had great flow. But I fell in loved with it for it’s character and charm. The built-ins, the vanity in the guest bath, the decorative hardware, the plantation shutters, they all spoke to me. We could walk our future children to the park. 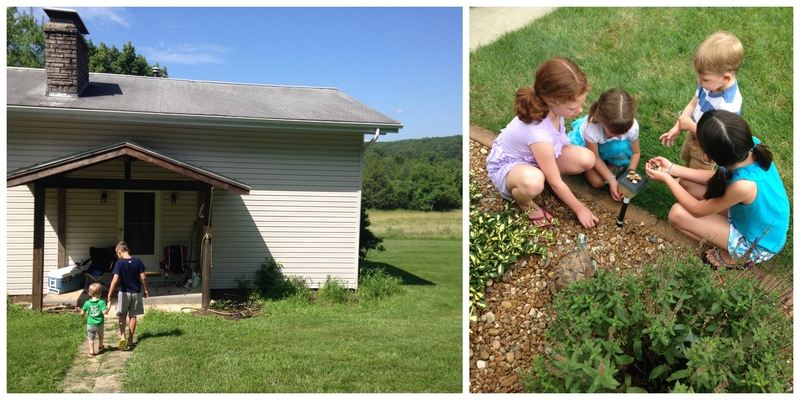 It was beautiful, the home flowed well and I could tell it was well-maintained. There were pictures of their three children, and generations to follow were present not only in photos but inside the walls. They had glow-in-the-dark stickers on the ceiling in each room where their grandchildren had placed them. I chuckled to myself as I removed them, yet kept a couple in place to have our guests enjoy them, too. There was “goo” from all the family photos Jane placed on the wall. And I still have a couple items from the estate sale they held right after we purchased the house. All these things would be enough to most people, but we got even luckier. We got visited those first years from our previous owners. They would have mail that would still come to our address, and I would chat with them about their (our) home or how they were. It became a friendship, and as we were due with Jack, they came over to give him a blanket. They wanted to know which room Jack would be in, and Jan wanted to see all the changes and even told John, “See, I told you we should have done…” this or that. But because of Jon’s Parkinson’s Disease or maybe because he didn’t want to see the house had changed, he would stayed back and chat with P, sitting in our living room, while I gave the full tour. Unfortunately, month before Jack’s birth was the last time we saw the owners of this home we now call ours. Because of John’s failing health, they moved to Austin. But we exchange Christmas cards and only have well wishes to send their way. But I have to tell you, I think of those two often. Not only do we drop their last name for street cred in our neighborhood circles, (even six years later) especially around the long-time homeowners but I think of them in other ways, too. I want them to be proud of us. Like someone in our own family. We have taken something very dear to their hearts and held it tight in our arms, and made it better, yet kept the really really good parts the same. I only hope they feel the same way. As I’m cleaning old knobs I took off of a vanity from a recent master bathroom renovation, I wonder to myself if these are original or if Jane or her daughter picked them out. And, I have grand visions of their life here, cooking Thanksgiving for the masses when they used what’s now our dining and living room as a dining room fit for 13-15 …and with that tiny oven! I think about the pergola and all her chimes and plants, and the backyard that looked so green and lush, which is now overgrown and lacking because we have little ones and no time set aside at the moment to do real yard work. I wonder if they did it all? I wonder if she did it all? I do know there was a Mary Kay area set up for the neighborhood to walk in the back door and pick up product. I do know how amazing organized she has, with everything labeled in the bookshelves to the deep freezer. It’s something I strive for. And, I believe more than one neighbor has a key to our old original front door. I laughed to myself the day our new neighbor came over to introduce herself and then proceed to give us an extra key to our house. I just marvel in this home and this neighborhood. Sometimes I want more or BIG or squeaky clean and new, but then I remember all this about our little home and am thankful to be the owners of such a treasure of not only our stories but many more from the past, present, and maybe someone else’s in the future. For all the work old homes give us, they are still my favorite. Here’s to another year in a wonderful home making amazing memories with the hubs and my two beautiful babies. Like with any second child, our baby girl’s nursery (and her scrapbook) is lagging behind. Way behind! We’re getting into ten months after her arrival, and I’m just now finishing her nursery! Jack’s nursery was completed months before his due date but not this one! I could not make up my mind!! It took me months to find a game plan, and even then I was unsure. Around month five, I finally got my sense of self back and started planning Meredith’s space. She’s been living in it for five months without complaints, but I didn’t like the half done walls, a mirror still on the floor, and space that didn’t feel like a little girl’s room. It was time. I have all the big ticket items; crib, dresser, rocker. It was the little items that were throwing me for a loop. There were also items that I hastily said yes to, and regretted later. Like the striped painted wall, which was cheaper than wallpaper (trying to follow a budget). I hated looking at it; it was all wrong; the color, the look, etc. I wish I would have spent the extra money for what I wanted in the first place. Meredith’s room was based more on a color and feeling than any actual theme. I went with blush pink hues with green and gold accents. I wanted a comforting, elegant and playful space Meredith could transition well in as she grows. The wallpaper accent wall is my favorite part of the space. I love the look against the light wood and white crib. The room looks brighter and more alive than the painted striped wall. Win-Win! The mirror just makes the statement, too! I was so nervous to put a hole in that pretty paper, but I’m glad the hubs did. Next to the crib is the rocker. Any mom will attest to needing this the minute they get home from the hospital, and I was no exception with both babies. I wish I would have thought about this room long before Meredith’s arrival because I would have purchased the West Elm glider in a different color for the space. The Graham Glider in dove grey was available in the store, so we bought it right up. I would have had to wait 6-8 weeks for a pattern or another fabric choice. 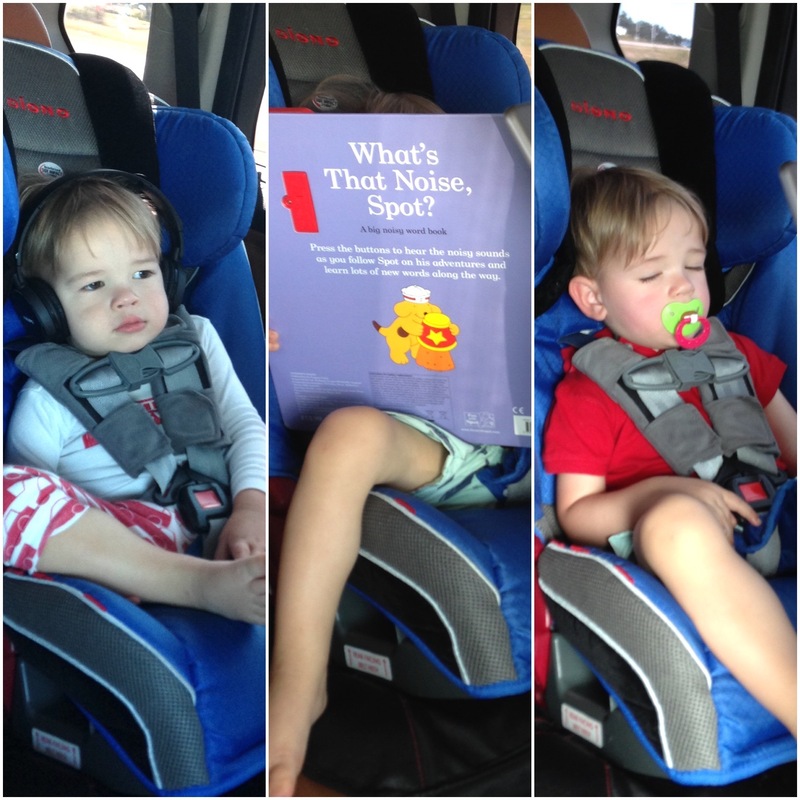 Another reason to start on your nursery early! This space has been great for reading, nursing, and snuggling. I’m sure I will spend many more hours happily looking down at my baby girl or out the window during those early morning feedings. These little shelves are super cute in this space, too. I think it’s the jelly to my wallpaper peanut butter! I love it! I needed a space to have books and this displays them well. Plus, how cute is Meredith and Jack’s pictures on the top shelf. Eek. These two pictures are perched on the top bookshelf and my heart skips a beat whenever I look at them. Above the changing table was hard. I switched the design numerous times and finally picked simple pieces I loved. The knob in the collage is for Meredith’s wipes. It works well and is really sturdy. I added new knobs to the closet doors and painted the back of the closet wall in a blush pink. The bins are perfect for keeping all those babies accessories. This space is so stinking cute! I can’t handle it. I’m very jealous of both my babies rooms, as they have the latest and greatest things in their rooms. But… isn’t that how it’s supposed to be? We think so. 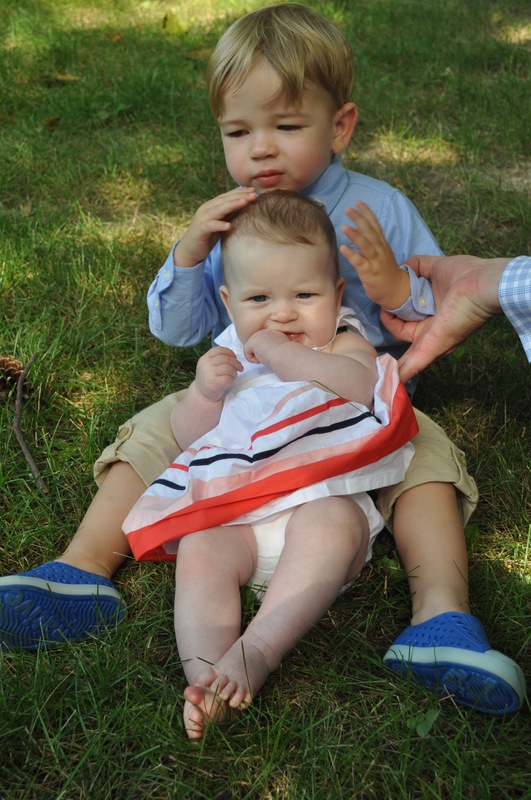 Meredith started her fifth month celebrating her older brother’s second birthday! 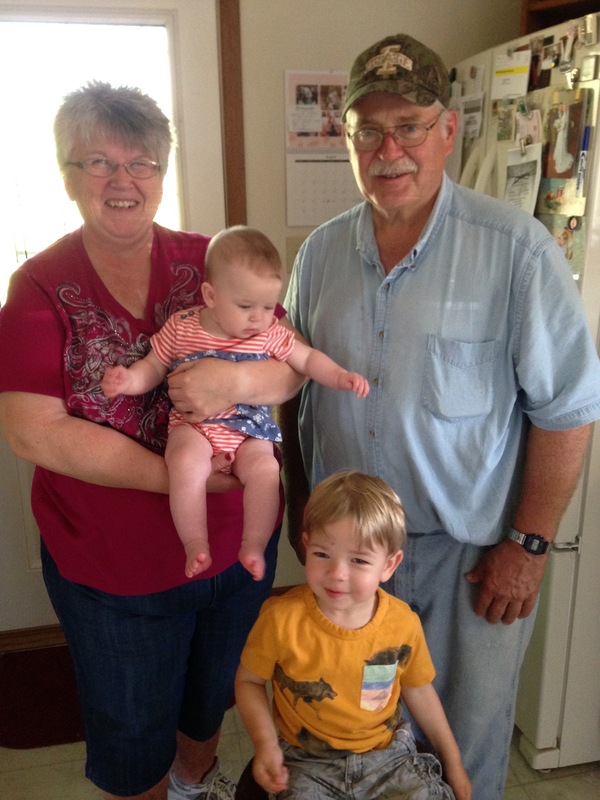 We celebrated small with grammie and papa. But he enjoyed the best dairy-free cake we could find! Angel food! Always a fan favorite. I had a little mom guilt not taking more pictures, or throwing a big party for our sweet boy, but maybe next year? We’ll see. 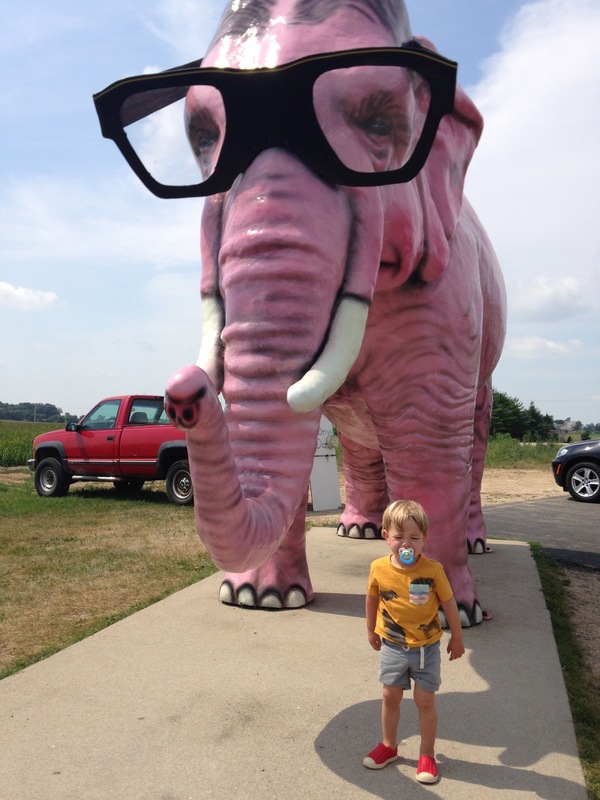 Right after Jack’s birthday we took the family on a midwest road trip. Much of our family is in the midwest, and we were lucky enough to have two weddings in a row to see much of them. We took the week in between to see even more friends and family to maximize the time spent in the northern states, while happily getting out of Texas during the miserable August heat! Our first stop was Story City, Iowa! 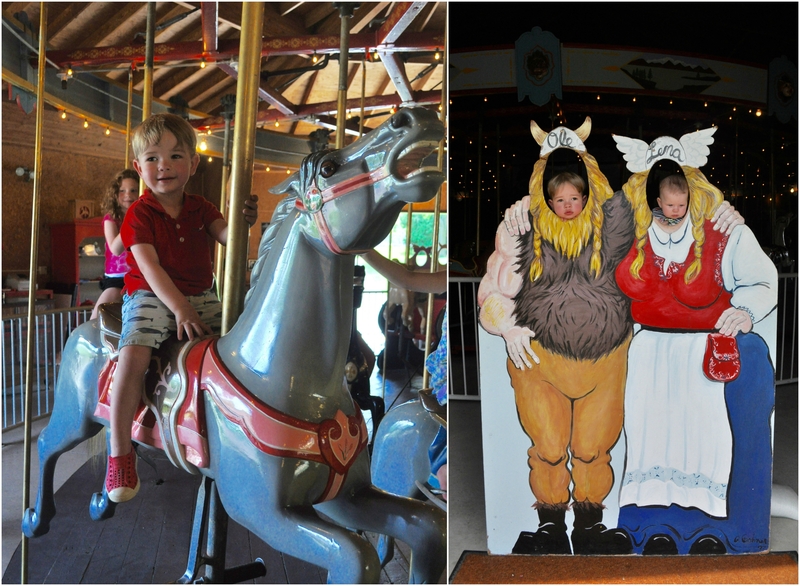 We hit up the local wooden carousel with our nieces. 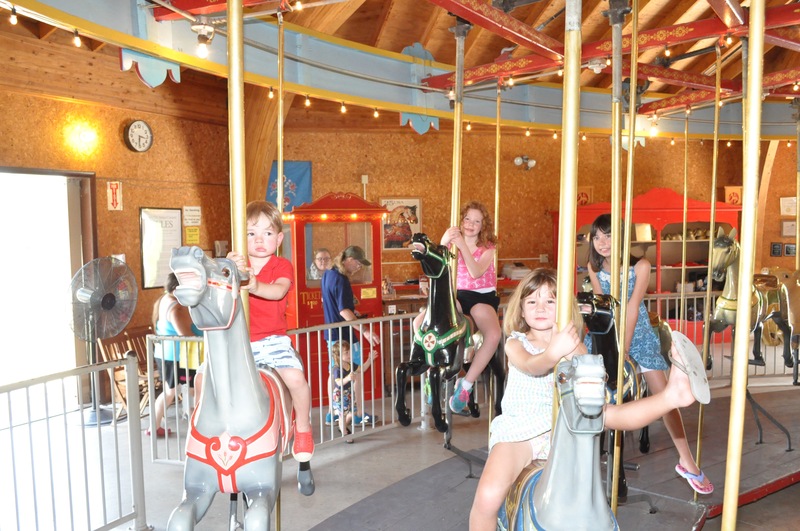 Jack was overjoyed to ride… and ride AND ride and ride again. We headed down to Ames for our first wedding and some hotel fun. I remember the joys of visiting hotels as a kid. The two things always on the agenda; the pool, and the array of cereals they had available for breakfast. 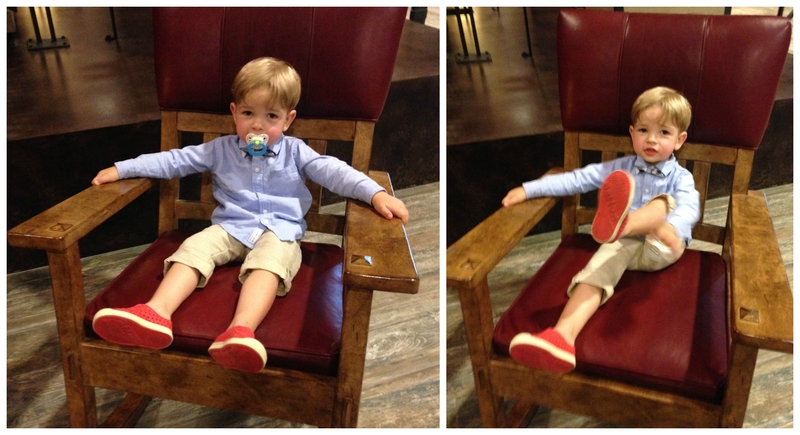 Jack enjoyed both with all the cousins. 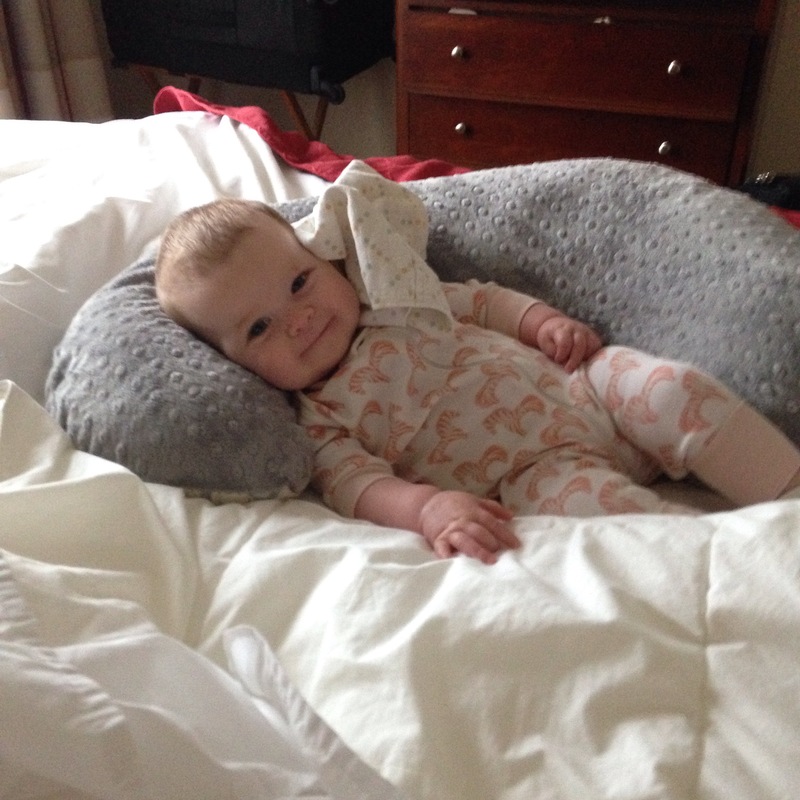 Meredith enjoyed chillaxin’ in the hotel room, too. After relaxing, it was time to start the wedding festivities. 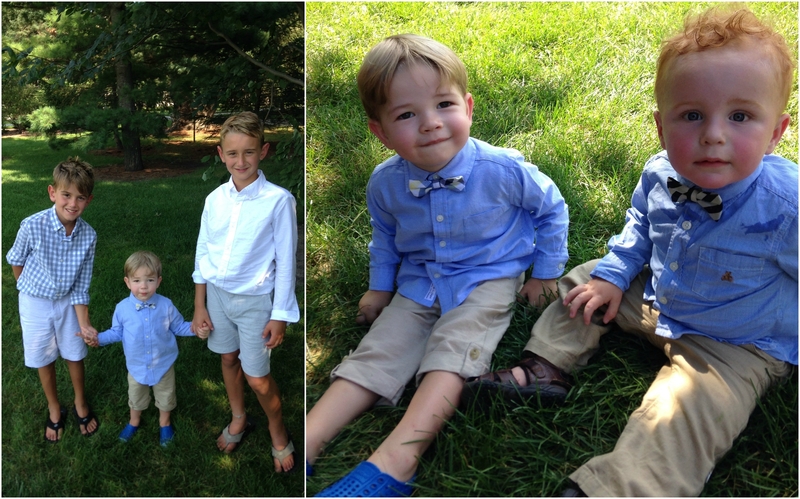 There was a bride and groom at this wedding but these kiddos were so cute that I didn’t get a picture of them. Eeek. 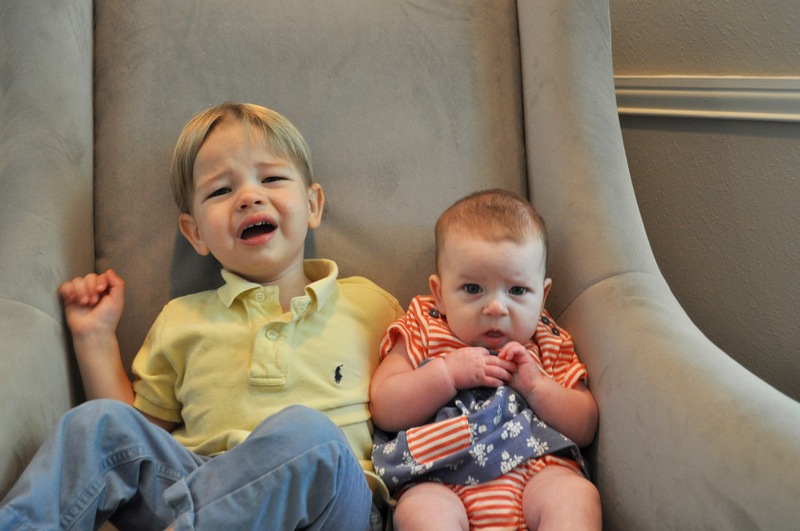 Of course, there was a failed attempted to get a picture of my kiddos, and well… I can say, I tried. Jack looks super excited to be sitting doesn’t he! We ate cake, danced, and had a wonderful time seeing family and friends, including Jack and Meredith’s Great Grandma Johnson. We headed out the next morning to our next destination, another small town in Iowa with warm hearts and a fabulous meal waiting for us. We were greeted with open arms and Jack fit right in. 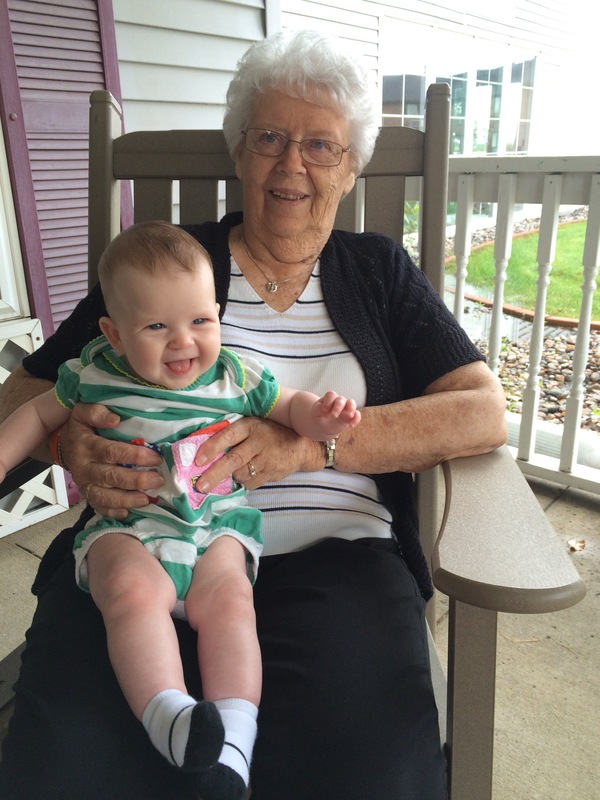 Jack and Meredith met their Great Grandmother for the first time. 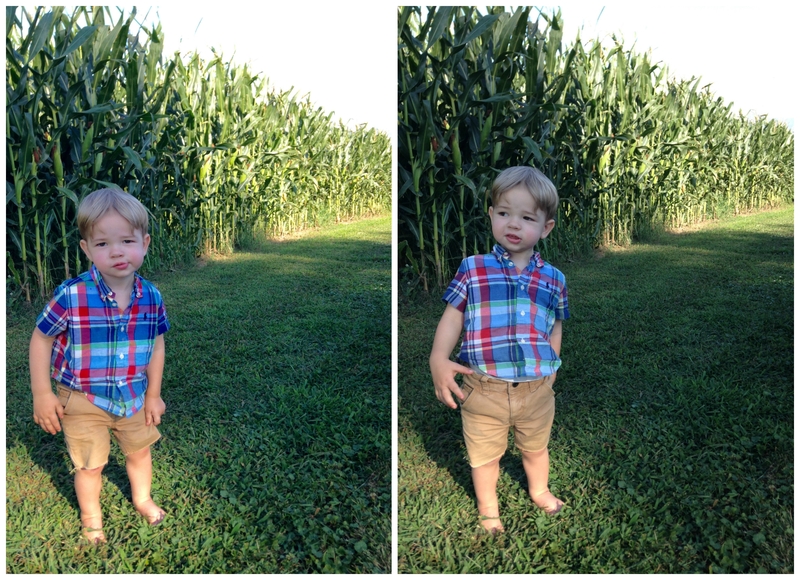 And Jack realized where that sweet Iowa corn really came from. 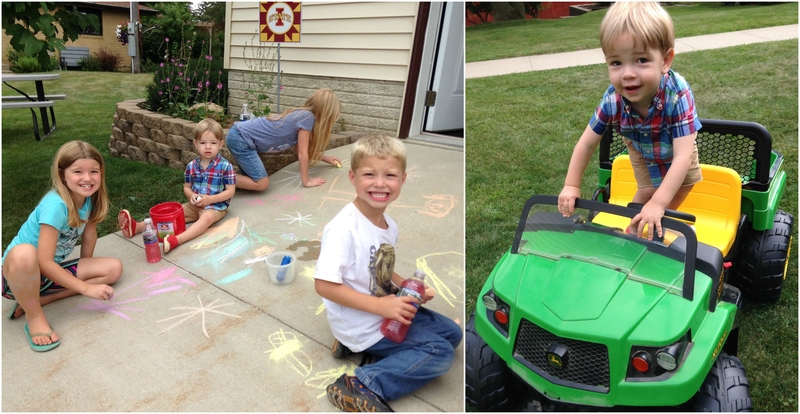 We said goodbye to our Iowa hosts and headed on yet another journey, this time to Wisconsin. On our way to see friends, we realized we were just miles away from a famous brewery. 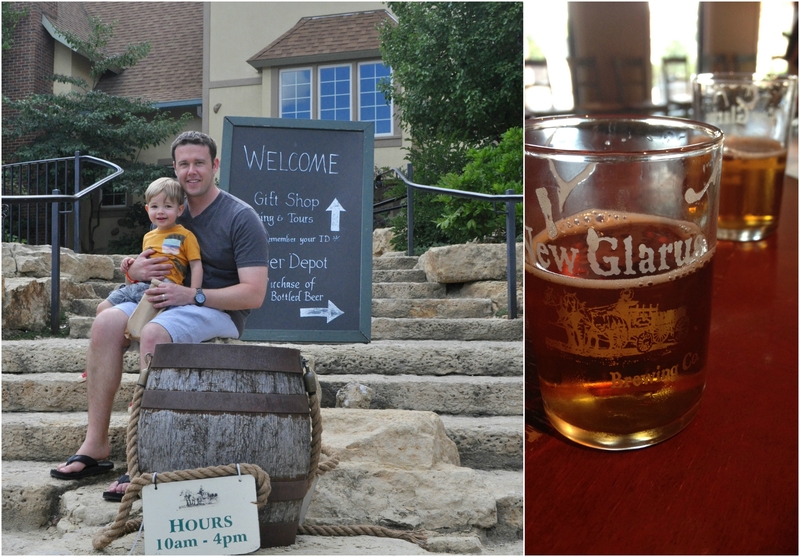 New Glarus, home of our beloved Spotted Cow! We made a detour and happily walked our babies through a brewery tour. Ha. 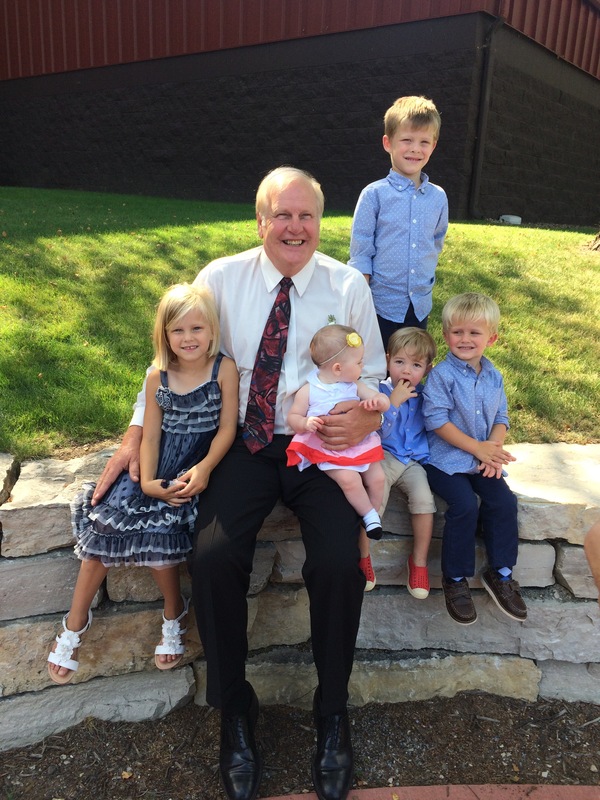 After the tour, we made our way to Appleton, WI, where we met up with our dear friends and their new baby boy. We spent time reminiscing, laughing at our ourselves and our babies, but mostly soaking up as much time together with each other as we could. We spent our night by the campfire drinking Spotted Cow in jeans and sweatshirts and the day with our babies. It was fabulously simple and perfect… of course, we didn’t get any great pictures… Trust me, I’m kicking myself. Travel hit us again, but Jack was an old pro by this point. We headed up to my hometown in North Wisconsin for the rest of our trip. 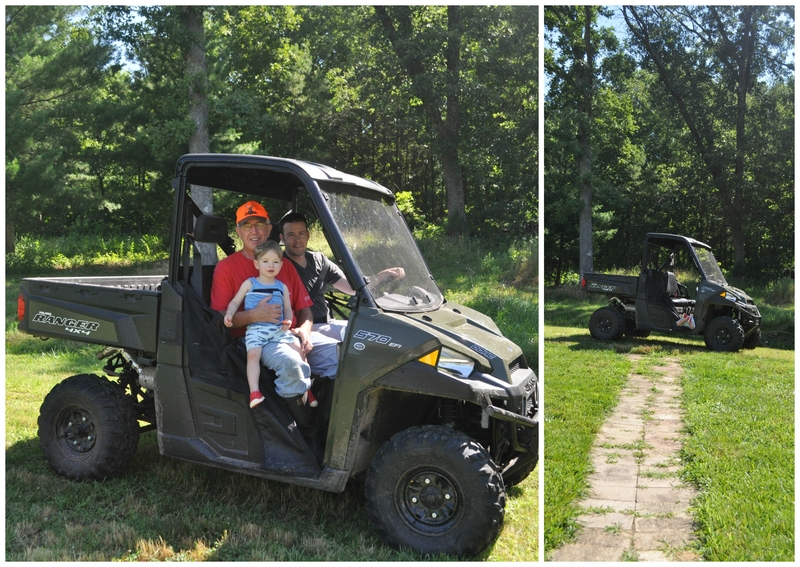 We welcomed the super green grass, beautiful weather, and, of course, a ride on Grandpa’s “tractor”. The hubs and Mer looked on, a little less impressed with the lawn-mowing-tractor than Jack was. Jack and Meredith’s cousins came into town, and they spent their days in the backyard (clothing optional) and on the grandpa’s boat. 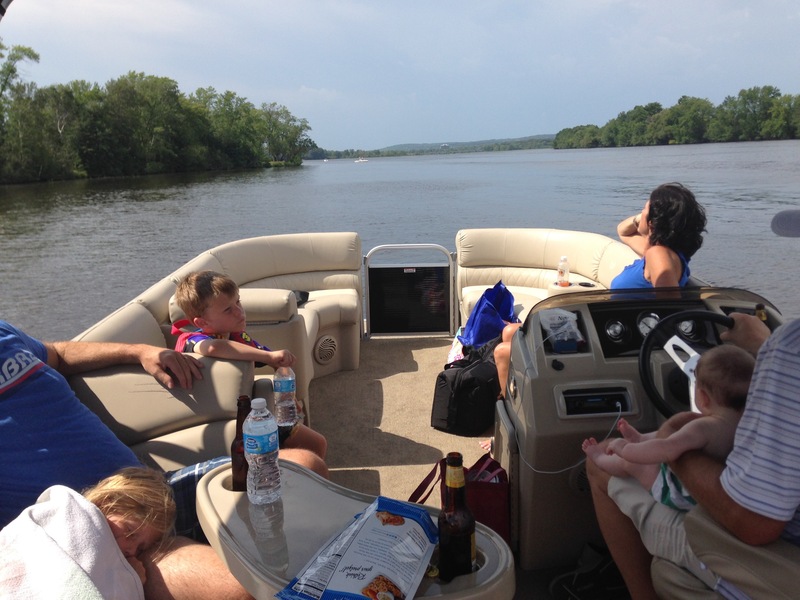 There really isn’t anything better than Wisconsin in the summer. Oh, how I miss it. The lake, the green, and the family. 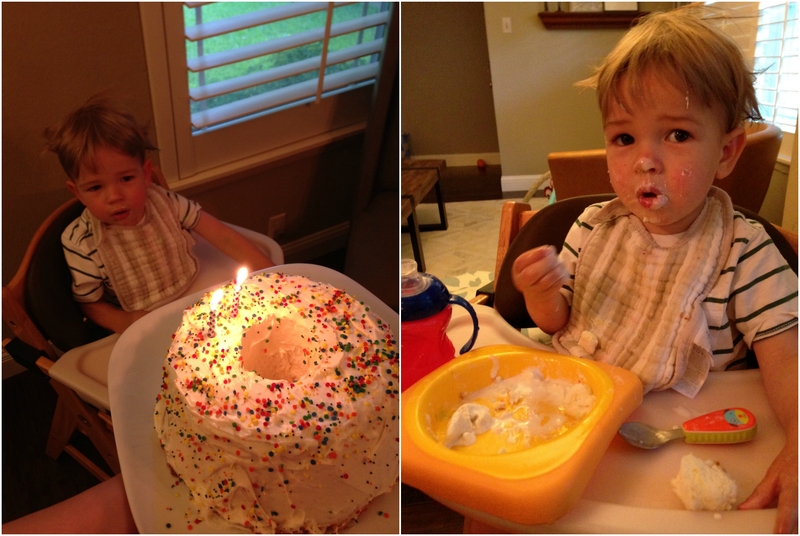 Jack celebrated a belated second birthday with everyone and ate up every moment he could. 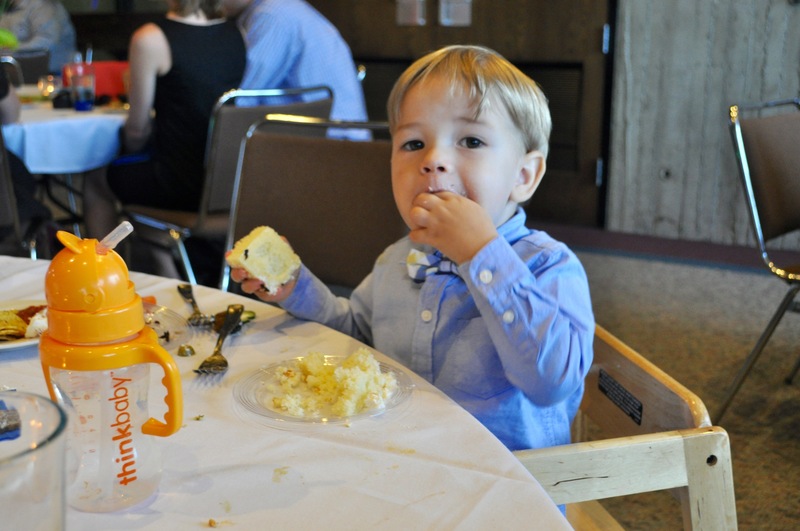 Our last weekend was spent at wedding number two … again, just kiddo pictures and slim pickings at best. Meredith made sure she was on point during ceremony. Atta girl. 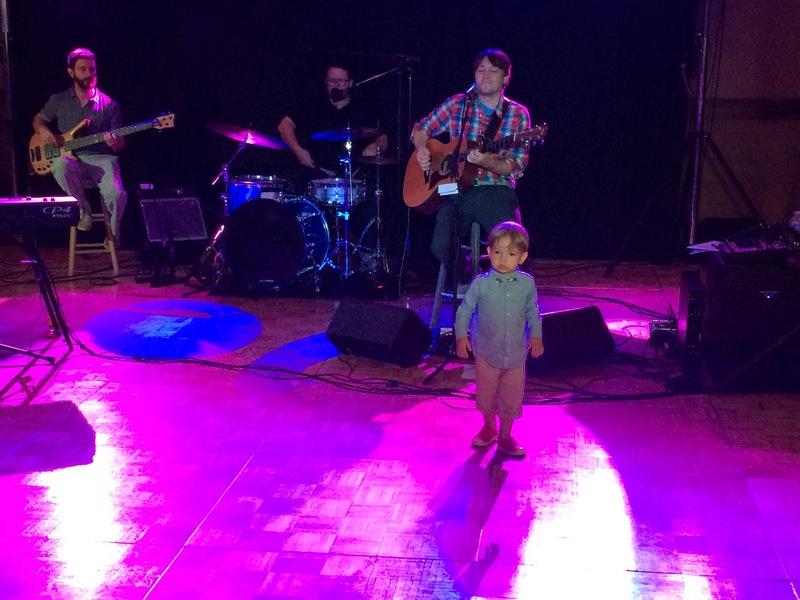 Jack took over the dance floor for the first few hours. It was hilarious and sweet all at the same time. He clapped after each song and danced his little heart out. He made many friends, including the band who came up to me after, in admiration of his love for dancing and good music. We ended our midwest adventure by splitting ways. We said goodbye to the hubs and Jack, and I said a little prayer for us all. Jack was nervous and not excited to have to drive home. Sorry buddy. Meredith and I headed out in style on a first class flight back to Dallas. Meredith was so embarrassed for mom to ask the pilot for a picture, she closed her eyes. But she was super excited to have a piece of cheese on her head! Wisconsin genes run deep. We all made it home safe and got back into our normal routine quickly. 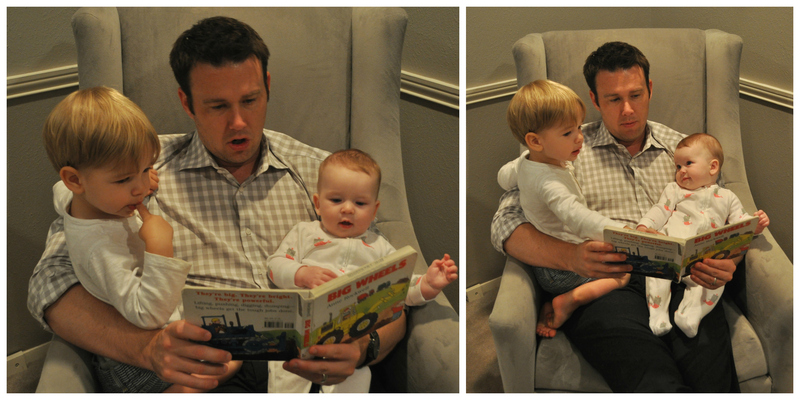 Bedtime stories with Dad is one of their favorites times of the day. 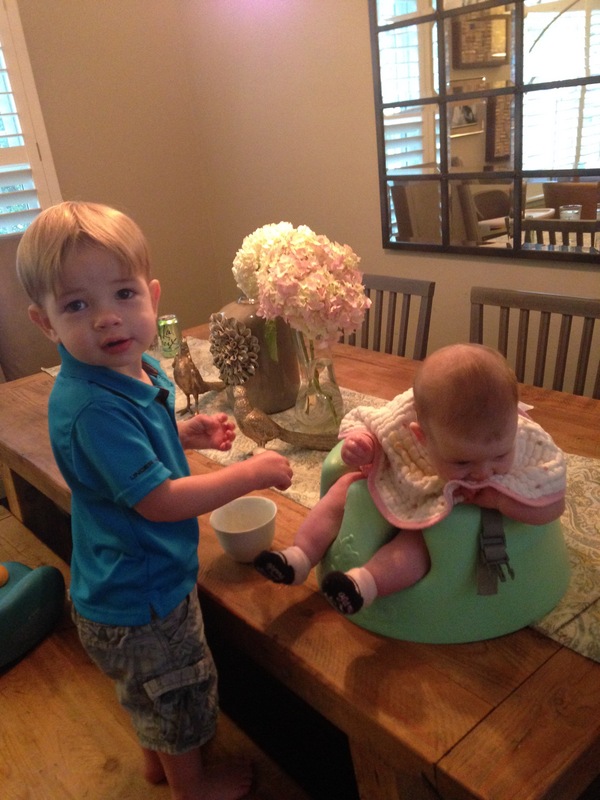 Meredith had her first taste of rice cereal served up by Mr. Jack. He was absolutely loving the process and Mer took her first meal like a champ! Month five was a busy one, but we are loving every exhausting minute. The hubs and I have been awakened a couple times this month to Meredith just talking. We laugh as she cackles to herself, and I know there will be nights in our future we’ll tell her go to bed! But for now, we enjoy her spirited squawks. Here’s my little lady at five months! Happy Weekend, Friends! When we made the long trek up to Wisconsin for a long and wonderful midwestern adventure, we came home with a lot more than just memories and, of course, a case or two of Spotted Cow. We were enlightened by some dear friends with yet another great way to love our beloved drink, coffee. 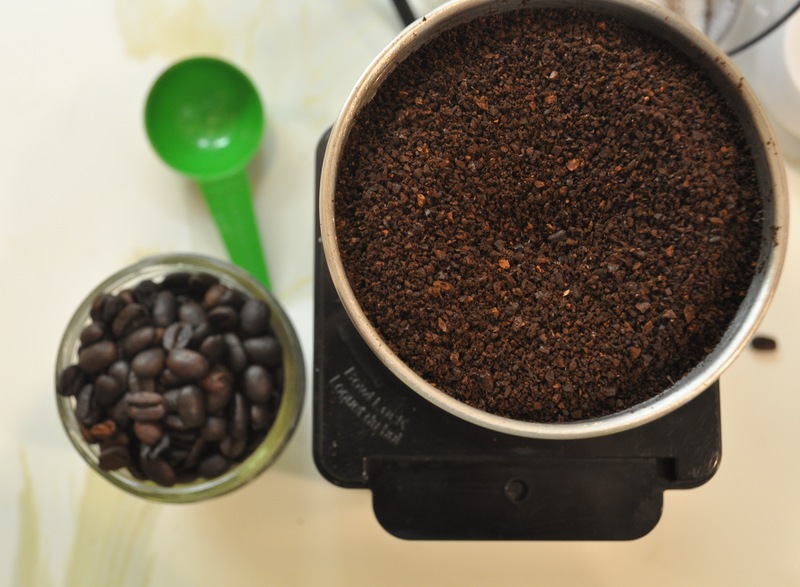 I love the process of making coffee, and this is another wonderful method to explore for yourself! It’s been an afternoon treat in this household for a couple weeks now, and I’m sure it will continue on for years to come. Enjoy! I bought our cold brew items on amazon. Here and Here. First, start by grinding your beans. 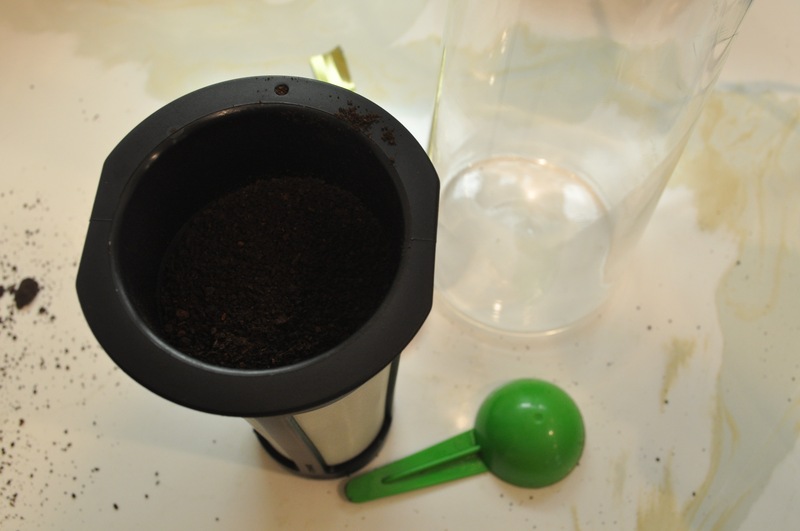 Then, place the coffee beans in the filter portion of the carafe. **Update** We got a new grinder, here. 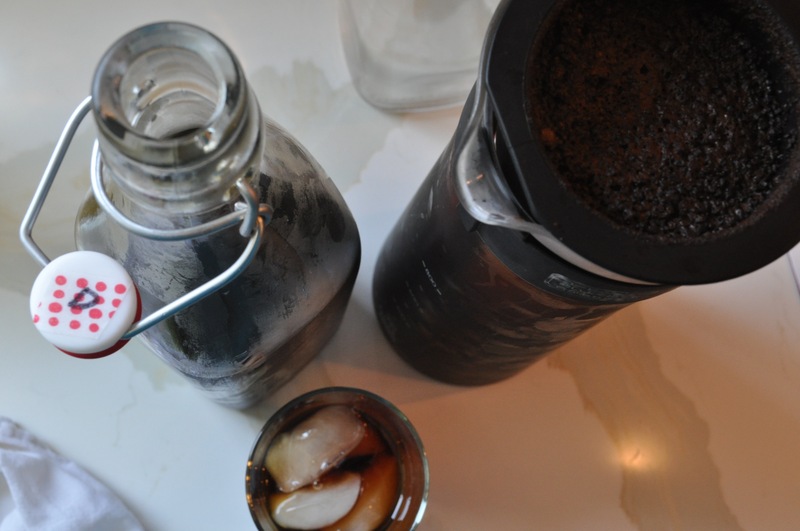 I use a 22 grinder setting for chemex coffee but for cold brew you don’t want it that fine. 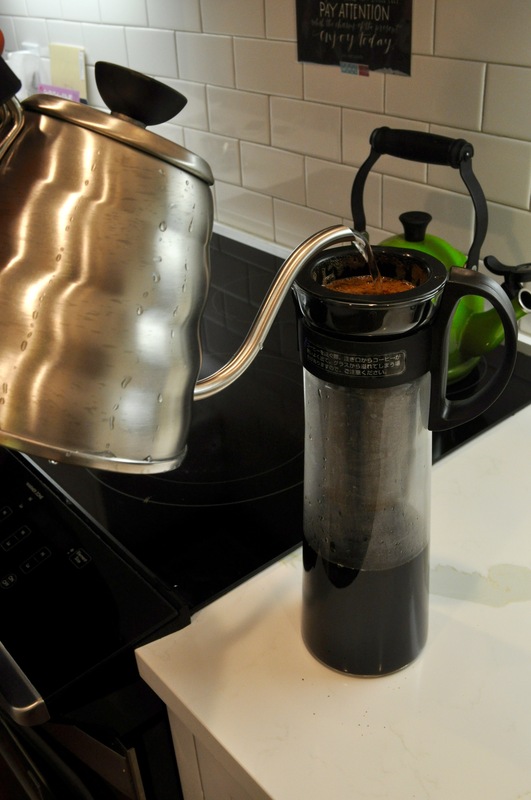 Ideally a 30 or so works best for us, more like french press consistency. 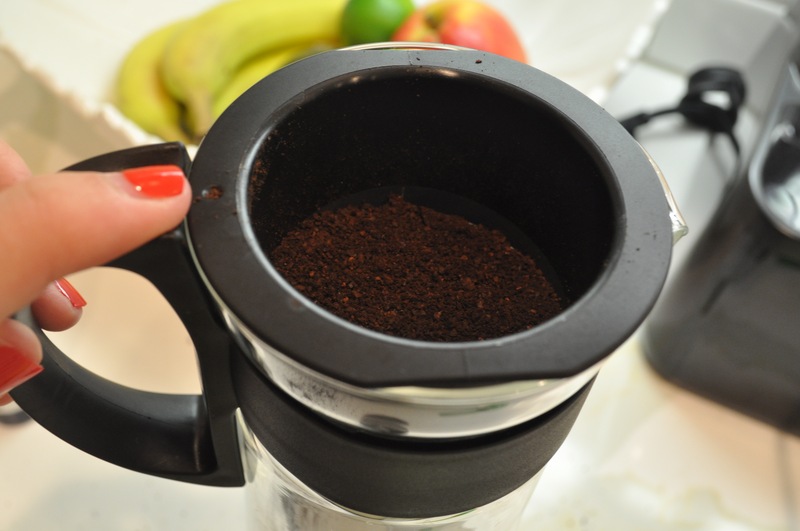 Then place the filter into the carafe, placing the little circle of the filter on the handle side. Then, pour away with cold tap water. Fill it up and place it in your refrigerator for a solid eight hours. 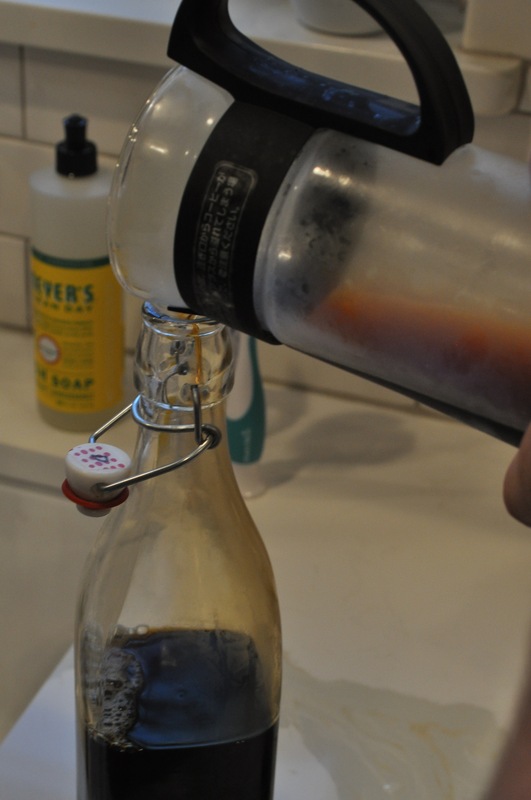 After 8 hours, we pour our cold-brewed into a jar to enjoy the whole week! I placed a “D” using washi tape, because we usually make one decaffeinated, fully caffeinated or half caff in our refrigerator. 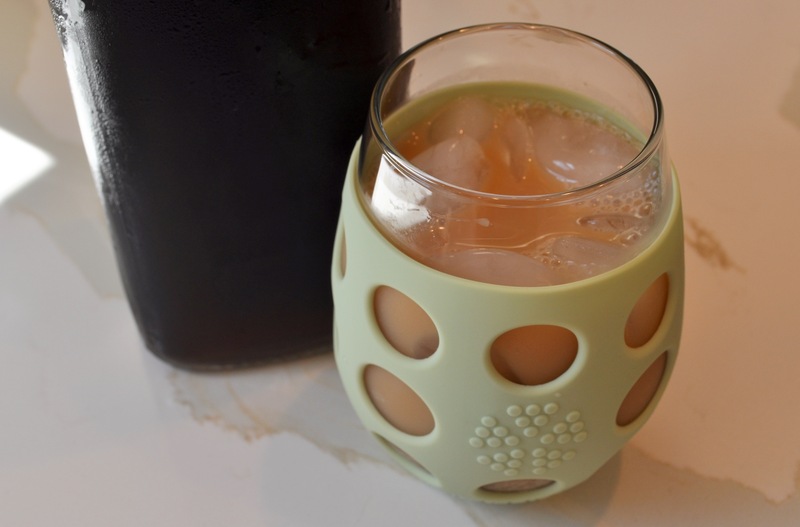 On ice with a little almond milk is the way we like our cup of joe but enjoy it anyway you like it! Flavored? Soy milk? Straight? So many fun options for this great treat! 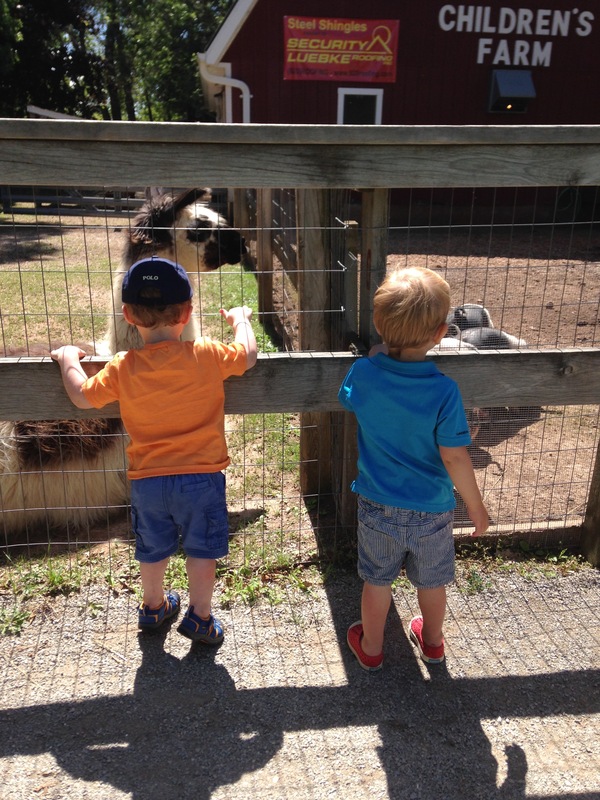 Month four was full of family fun! Meredith went on her very first road trip and loved every minute! 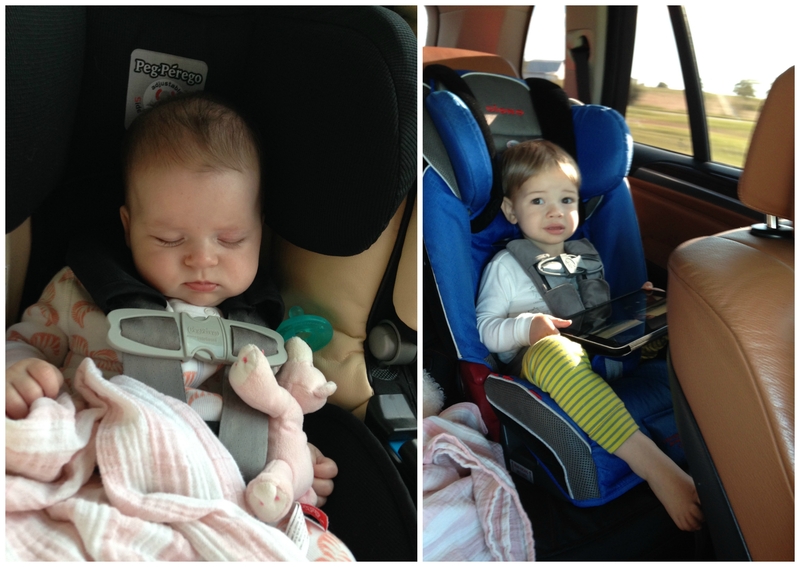 She loved being entertained by Jack, loved the open road… and slept a lot! Jack was a little freaked out about having “TV” in the car. Mind. Blown. 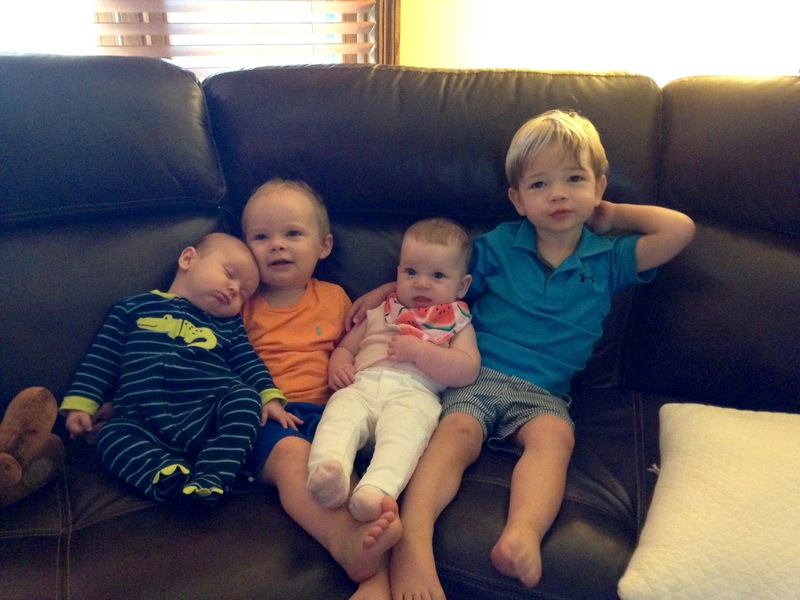 Meredith met her new cousins for the first time and agreed with Jack’s assessment on just how cool they really are! We headed out to grandpa and grandma’s new farmland. 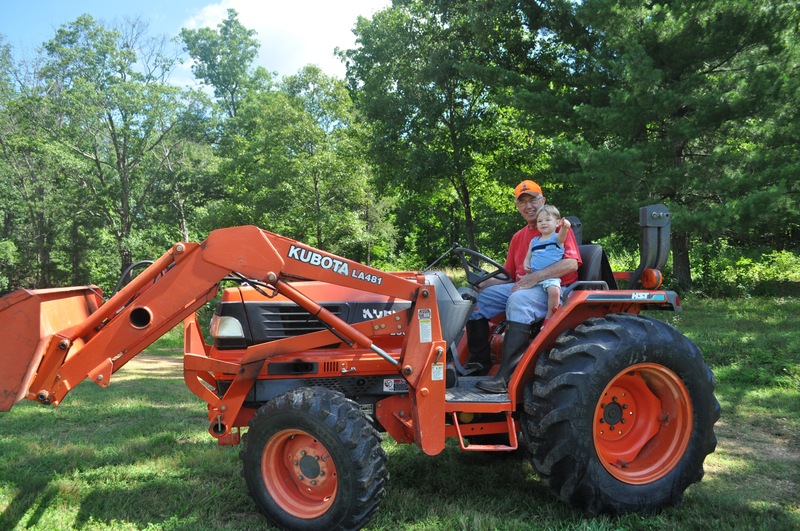 Jack was so in love with every aspect of this new heaven that Papa will forever be synonymous with tractor! Believe me, these two had so much fun. 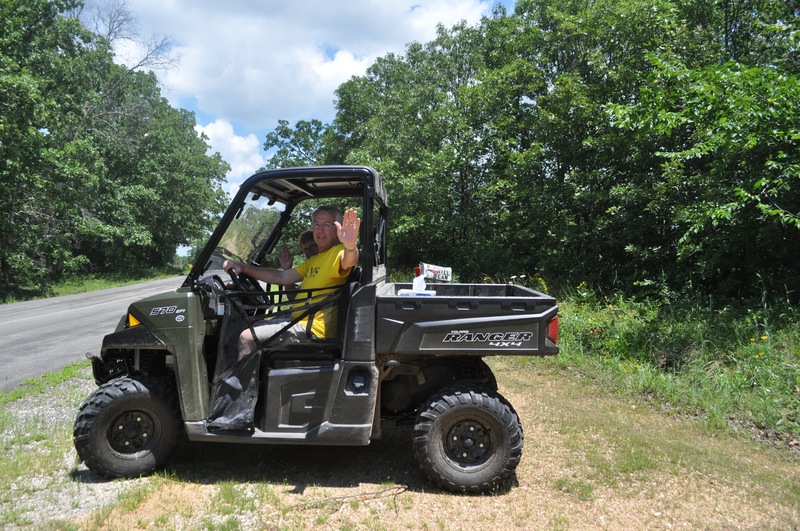 Jack loved getting rides in the Polaris ,and after a couple of rounds he figured he could venture out on his own. With all that wonderful fresh air and activity, some of us didn’t make it through dinner. 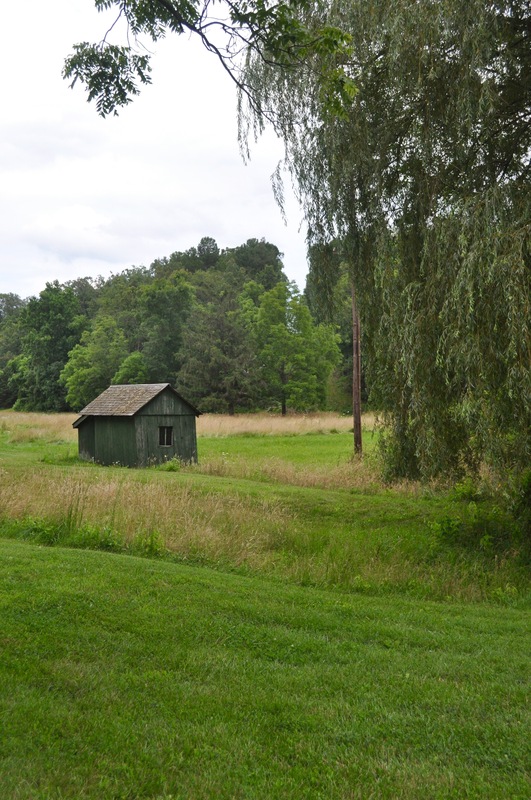 I took a stroll around the property, taking in all the scenery. 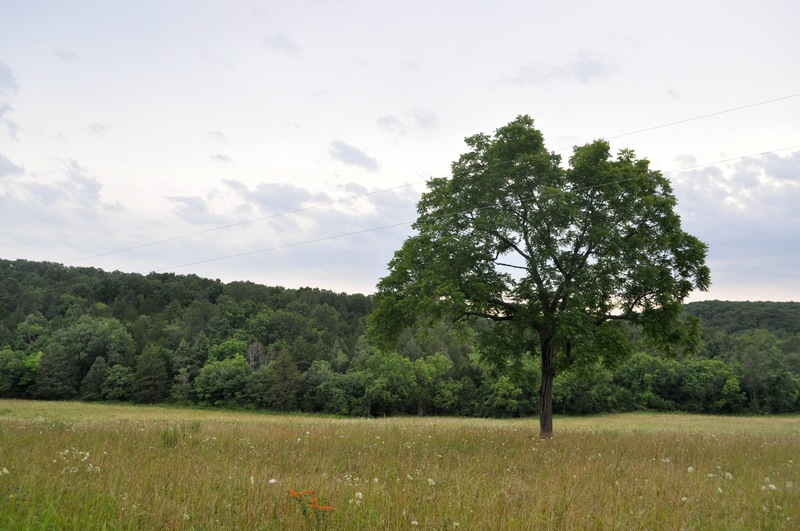 It’s a wonderful peaceful landscape and I cannot wait to see this beautiful space in the fall! We said goodbye to Grammie and Papa and headed back to Texas. The rest of the month was spent staying cool. 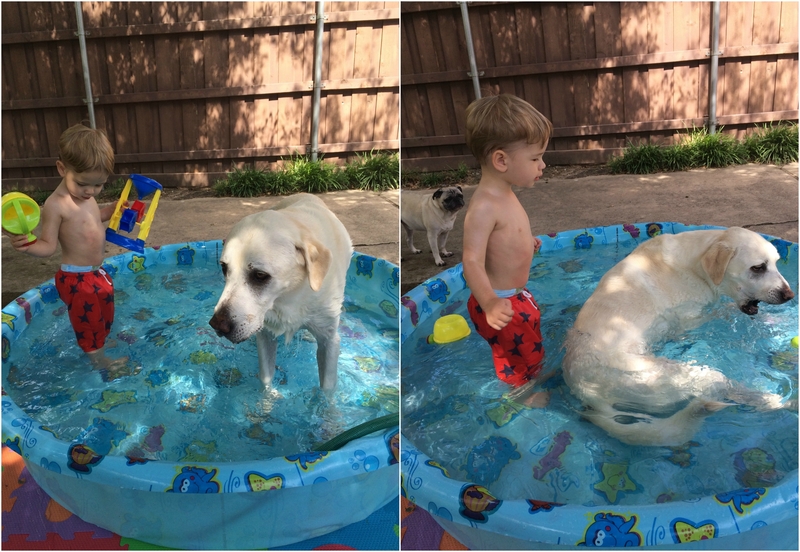 In our backyard and at our neighborhood pool! Boston always loves join in the fun. 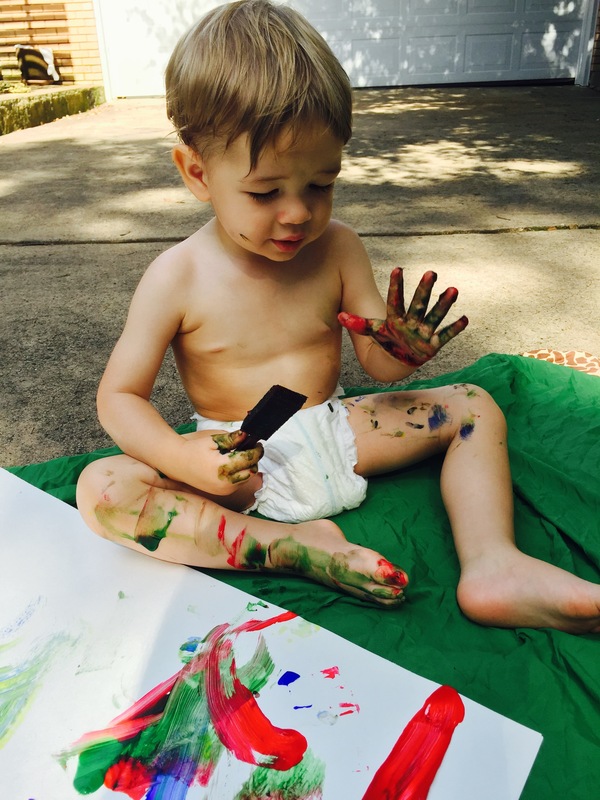 We found our inner Picasso this summer, too! Painting a Kaboom! for July 4th. 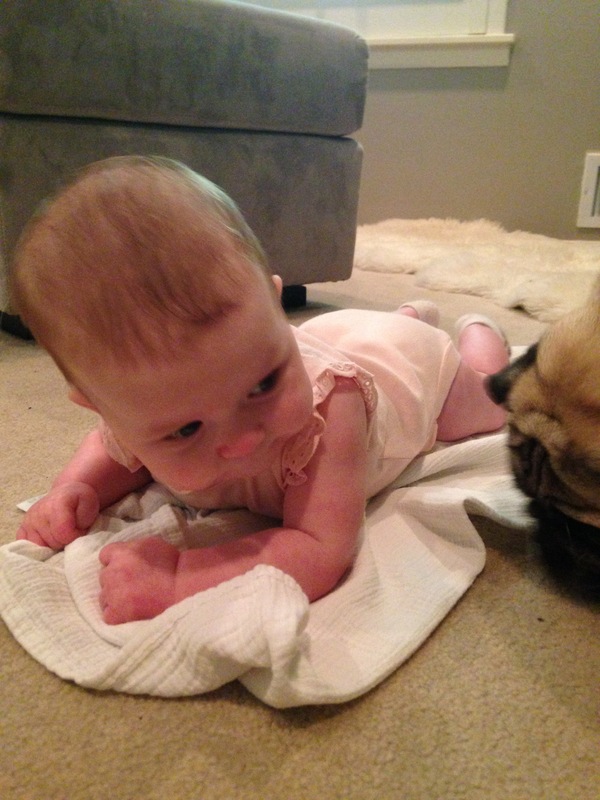 Meredith decided to rollover for the first time on 7/2/2015, and five days later she rolled over and pushed herself up. We all know Otis has been working with her for weeks. He’s such a great trainer for tummy time and meal time! On Meredith’s four month birthday weekend, some of our Missouri family came down for a visit. 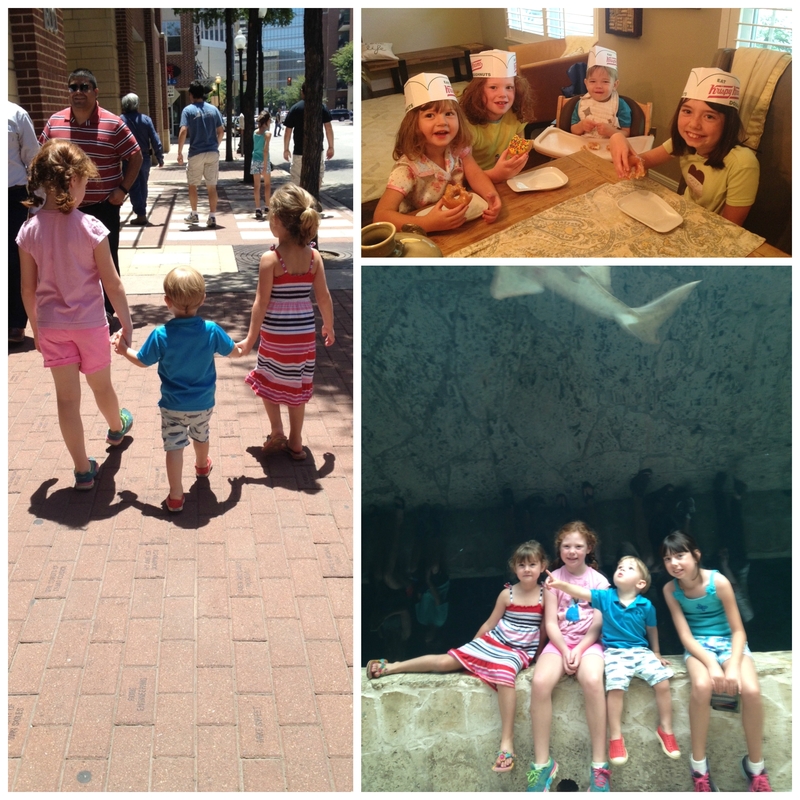 They had a wonderful time exploring all the great attractions Dallas has to offer and let Jack tag along, too. Our doctor’s visit was for both Jack and Meredith this month, 2 whole years and 4 months! I tried to hold back the tears, but they are both so perfect. Or at least that’s what I heard! But mostly, I try to capture my little ones doing what they do best, enjoying each others presence and getting annoyed at mom wanting a picture or five hundred! Month four has been wonderful! This is the age I so dearly love! 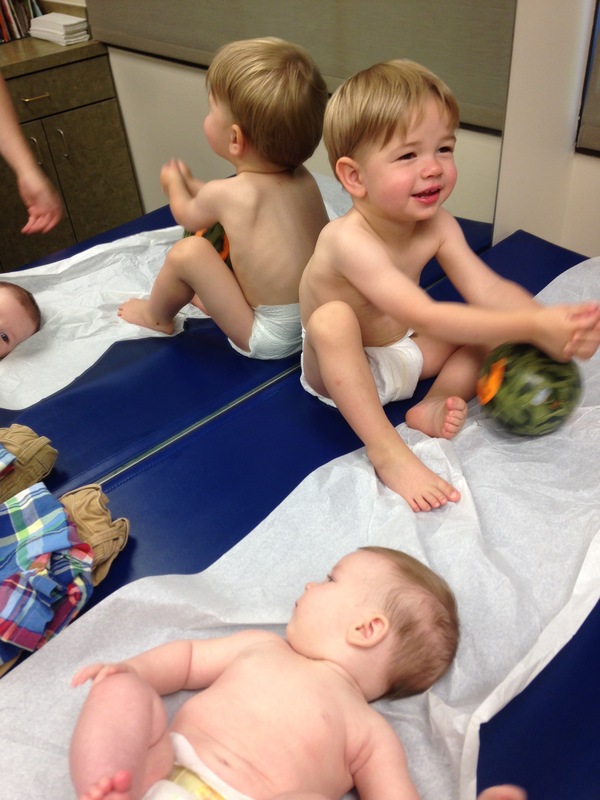 They start interacting with the world around them, and they start laughing and smiling so much more. It’s just wonderful! This sweet baby girl has turned three months old, and it’s been flying by! I know, I know, this post is a little super late, but there has definitely been a void not having these posts up. I have notes on my phone about when milestones have happened each month, and I vow to the get the next three posts up before Meredith turns six months. I want all these times recorded! Month three went by so so quickly. 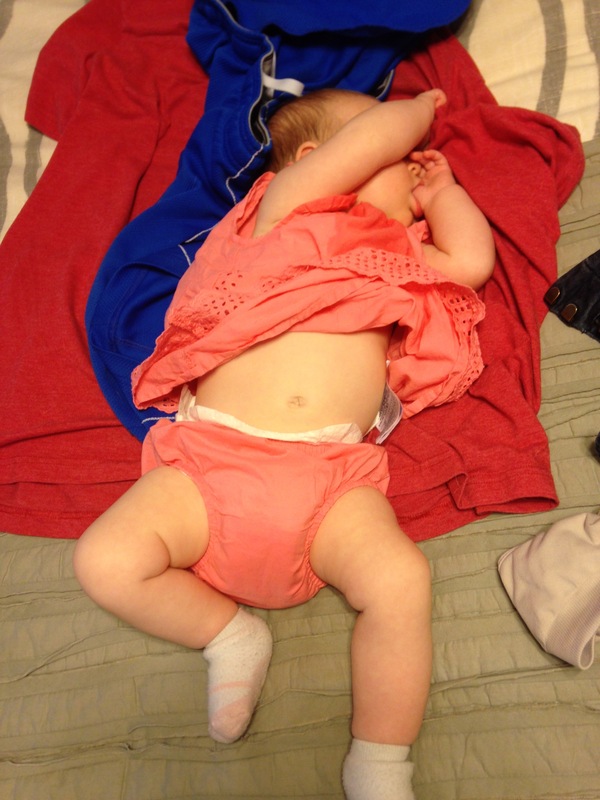 Once we figured out Meredith’s dairy allergy, I think she spent most of month three recovering with a full, happy belly and some much needed sleep. 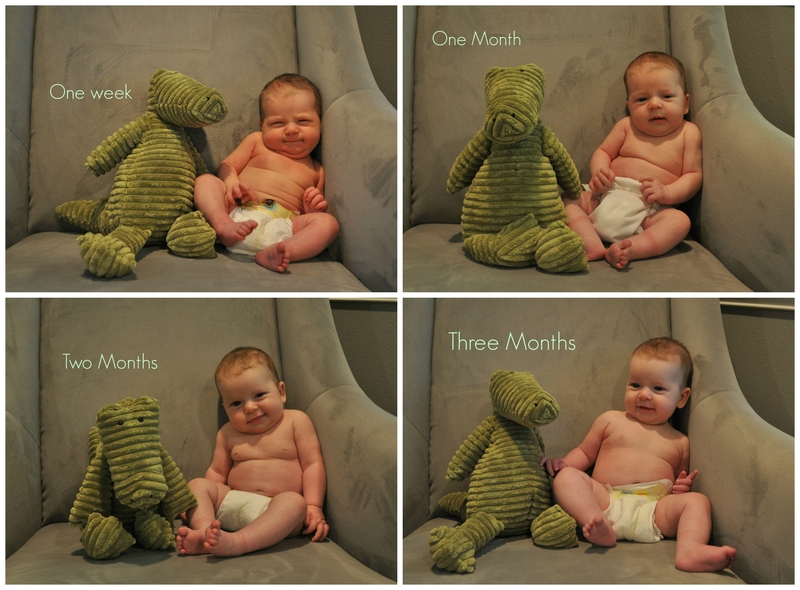 At 9 weeks she was sleeping from 10:30 pm – 5:30 am, and a week later 7:45 pm – 6 am! It has been wonderful. Though, we discovered that she discovered a great new tool (though sometimes elusive) to help facilitate her sleep… her thumb! Yep, we have a thumb sucker. I realize I should be shuttering in fear. I should be up in arms about what it will do to her teeth, how we have to stop her when she gets older. But (strangely) I’m not, I love it. She has her comfort item attached to her at all times and mama gets to sleep and how cute is she with it… don’t worry, I know I’ll be eating my words when she’s five! 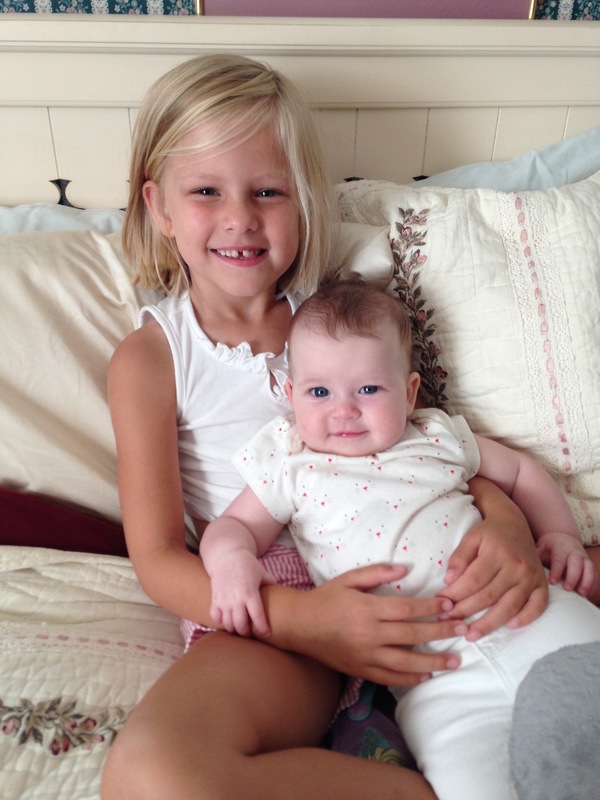 Her big brother Jack has taken the title quite seriously, and is loving being a big helper around the house, waking her up in the morning, giving her baths, putting blankets on her and just loving on her. He’s just the sweetest little guy, and I cannot believe they’re still mine. 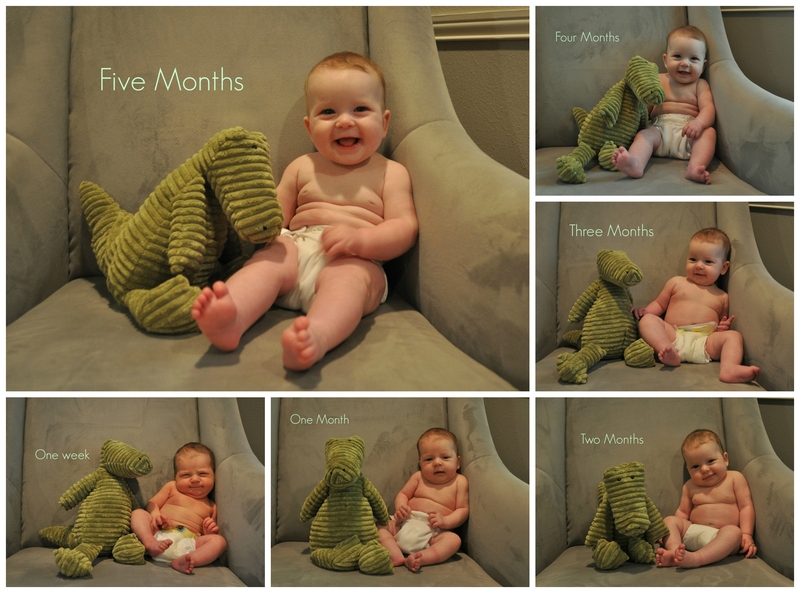 Before I start to get sappy, here’s Meredith’s three month collage! She’s getting so big! She’s been rolling to her side and almost rolling over, too, but her little arm is getting in the way. Maybe next month? Ha. I love you little lady!! Do any quick google search for diet, and you will find a plethora of weird routines and regimens. Some claim you can lose weight in days, others talk about finding your inner caveman (or woman) or making sure you don’t consume anything with eyes. Ekk. I have tried a couple diets myself, usually ones that would restrict my caloric intake or reduce something I was consuming at the time. But, inevitably, I would want that restricted something and the search for another diet would continue. Meredith’s second month was a rough one. 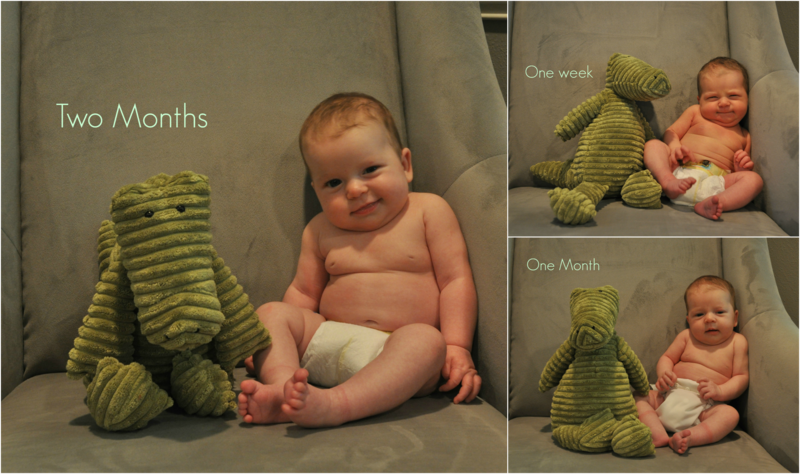 Jack at two months was a relatively easy baby. We were even warned on numerous occasions that he wasn’t “the normal baby”, and no one gets that lucky twice. Yes, seriously, people would say this to us. So, I figured we were getting our fix of a fussy baby with Meredith. Meredith, frankly wouldn’t let me put her down, even for a few seconds. Or even hand her to the hubs without crying nonstop, and I mean non-stop! This included her lip quivering, losing her voice, and gasping for breaths. No one else could comfort her. No one. I would try to set her down and the crying would start again. There were nights I would sleep on the couch with her nursing continuously until we both fell asleep. It was rough, and I felt super alone and hopeless. Even with the hubs in the same room trying to help, I felt alone. I felt I did something in the pregnancy that made her unhappy or she got all our “bad genes” or something else crazy. Disclaimer: I was also postpartum crazy town, truly sleep deprived, and pulling at strings. I feared what would happen when I went back to work. I even dreamt about our nanny quitting over this. It was all truly exhausting. And I still had a toddler that wanted my attention and a household to be involved with. One day I was changing Meredith, and I ask the hubs if he ever noticed that she doesn’t lay her legs straight. He said he hadn’t but thought it too was weird. We then noticed Meredith starting to get a facial rash. It continued to her neck and shoulders throughout the next couple days and down her arms. The hubs noticed the rash would get more red/inflamed after I would nurse her, and we thought it might be a detergent or soap I was using. As I’m writing this it seems so obvious it wasn’t the detergent but we didn’t know. 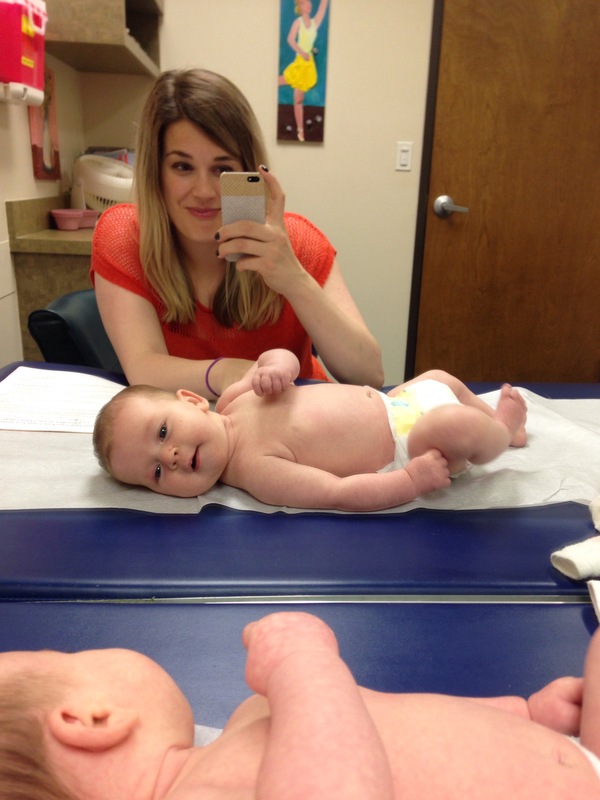 I swallowed my pride and took Meredith into the pediatrician. He took one look at her, reviewed the fussiness, gassiness, projectile vomiting baby I’ve been dealing with for the last 5 weeks, and he said it could be two things. 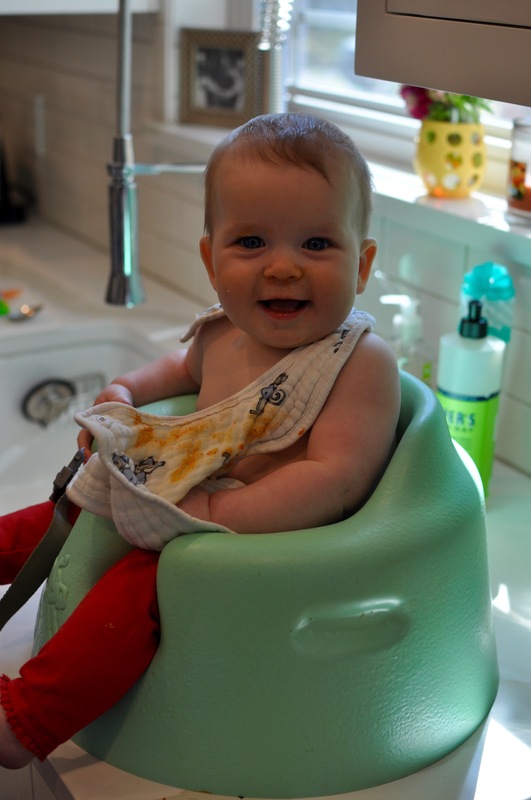 One: Just colic and acid reflux, we could manage this with reflux medication and gripe water. Or two: she could be allergic to your milk. The pediatrician said if he was betting man, he would bet milk allergy. With a cringing face, he turned to me and said this would be hard. Milk is in everything, even processed foods, like Tostitos lime chips we would later find out. Two things happened in that moment. ONE, I felt horrible I didn’t see it sooner and she was looking for me for comfort AND I was the one causing all her pain! TWO, thank god we may have something that is/might be causing all her symptoms! Maybe we will get lucky twice, with a little work this time!! That instant I stopped all dairy (first a little pity party of “why me”) and my diet was born. It’s amazing how easy it is to quit something you thought you loved like milk, cheese, yogurt, ice cream, etc, for something you love even more. Your daughter. 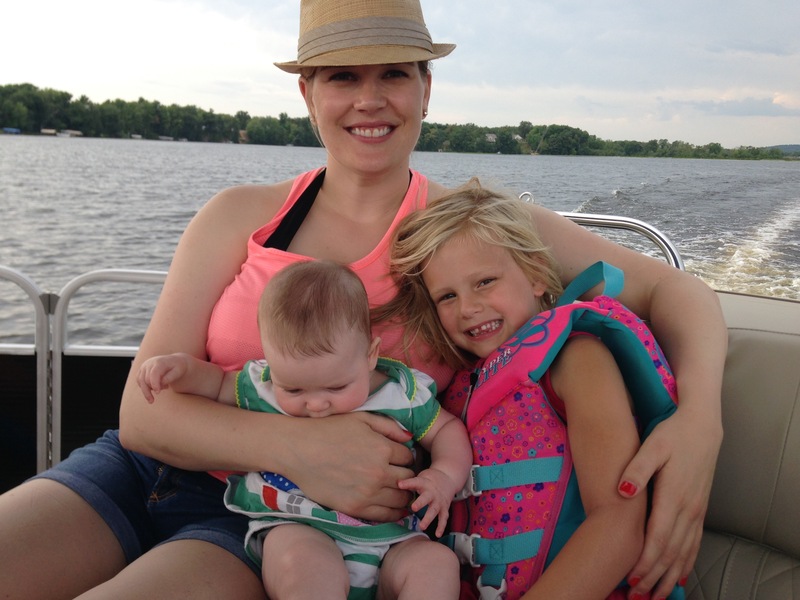 I was committed to breastfeeding Meredith as I had breastfed Jack, and now there was an even bigger reason. An even more customized milk I can produce and provide for my daughter. 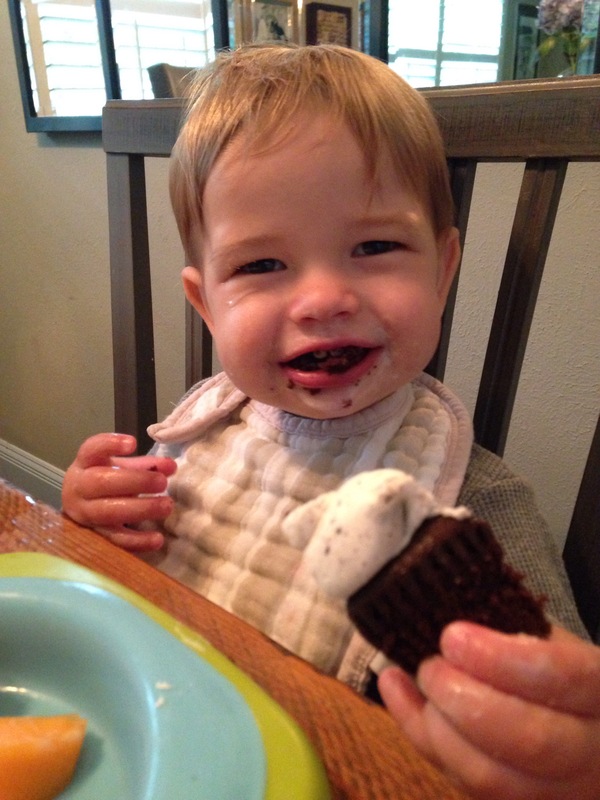 Jack eating a vegan cupcake! Team Meredith! A new dairy-free google search was started! I have become comfortable reading labels and tweaking recipes to keep with our new diet plan. Within days there were signs of improvement, which helped fuel my efforts. Meredith spit up much less, was less fussy, the facial rash was receding, and she was letting her legs down a little flatter. 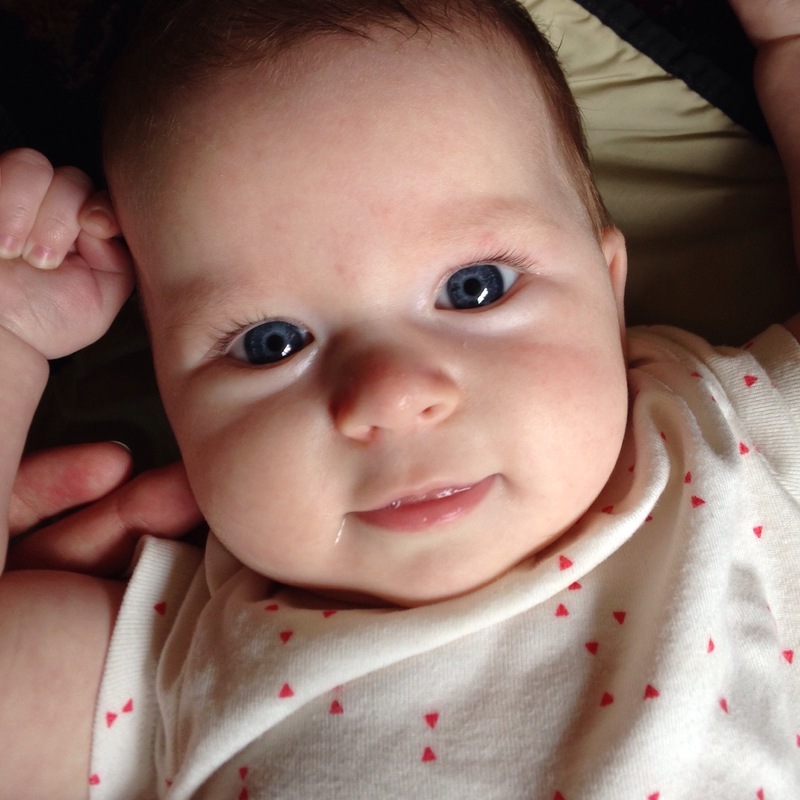 By week two she was enjoy life, smiling, cooing, and sleeping in her crib for six hours at a time!! At her two month check up, she was sleeping 8 hours at night, happily being held by others and enjoying being set down in her swing or on the floor to play. 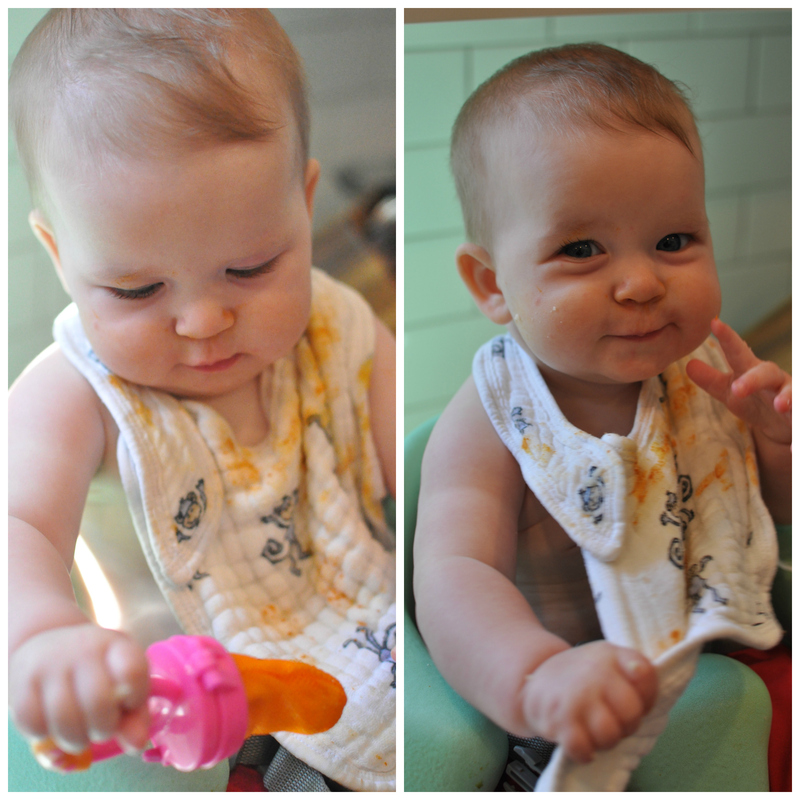 She was a completely different baby, and I would say with a little extra effort, we DID get amazingly lucky twice!! So, if you are looking for a diet routine, I have the one for you! You’ll start instantly and won’t falter! First, get pregnant, have a baby, and have them have an allergy! Dairy is a good one to get away from processed foods. Works every time! Ha! You’ll change your whole world especially if that means a better outcome for your child. In all honesty, cutting out dairy has made me eat more clean and whole foods. Lots of salads, minimal ingredient items and vegan products I never thought I would try AND actually enjoy! I hope to continue this healthy minimally-processed eating WAY past Meredith’s dairy allergy. Though, the Ghiradelli semi-sweet soy chocolate chips and angel food have been a lifesaver for my sweet tooth! I hope with my efforts she will overcome this minor allergy sooner than later! Thanks Meredith for makin’ our household a little more healthy! We love you so much and think you are pretty cute too!